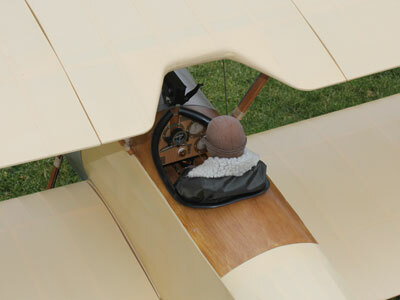 A bit windy and a lot cross wind for the first flight, but looks fantastic in the air. On landing I found that one of the front rigging retainers had failed, I was in 2 minds whether to double up on the rigging with turn buckles, glad I did otherwise I'd have lost the model. 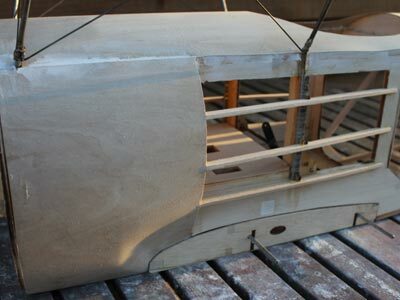 Some shots showing the detail around the cabanes and the undercarriage, the rubbers acting as suspension are horse braiding rubber bands. 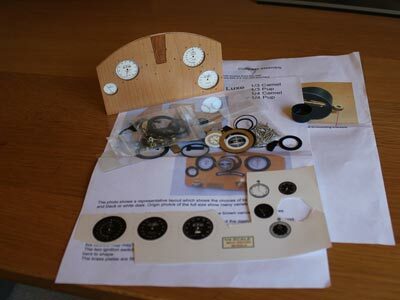 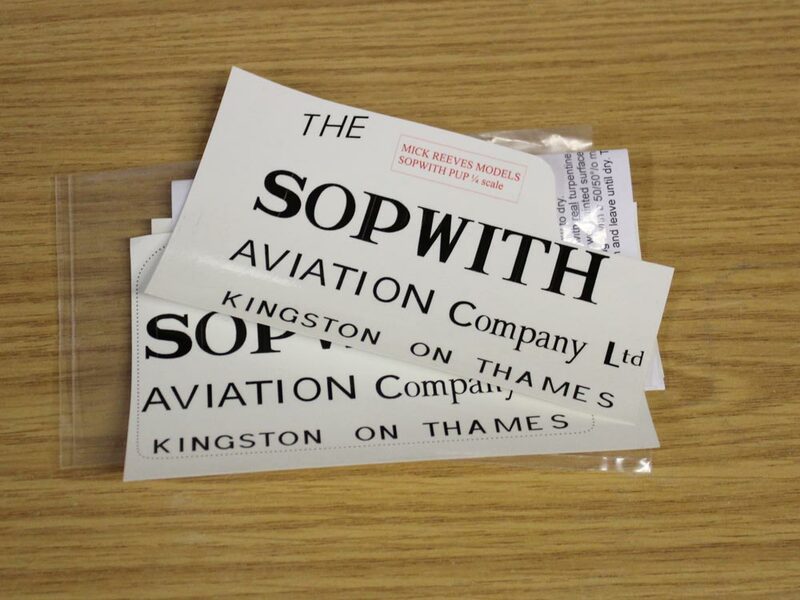 Nearly there, this is the first time all together, Roundels come from Tim at Modelmarkings, pilot from AH Designs. Next job is the rigging. 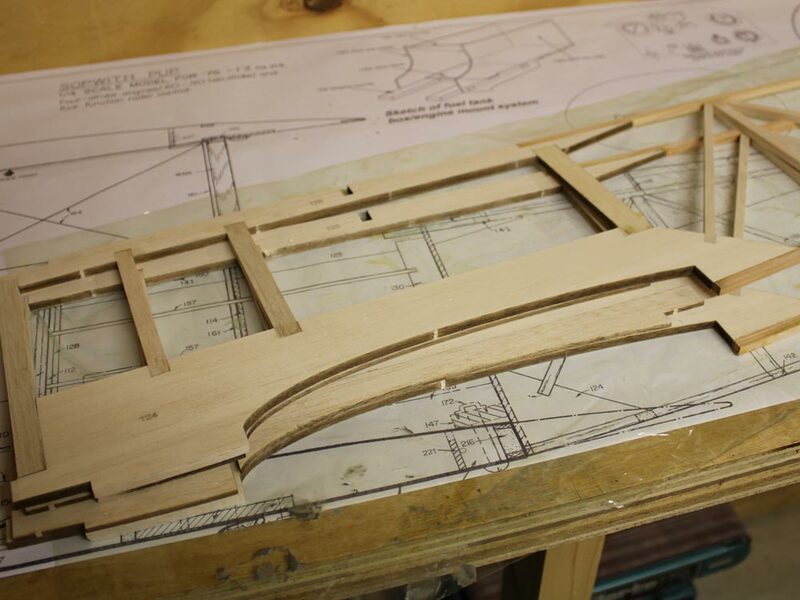 As we all know you need to get a ton of nose weight as far forward as you can get. 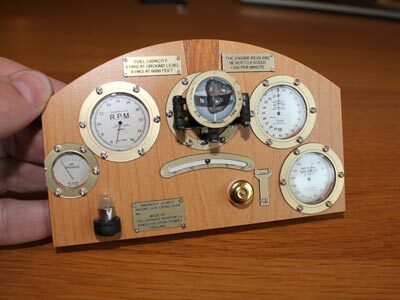 Luckily for me I have a brother who is an excellent fabricator (and model boat builder) and he made me this nose weight. 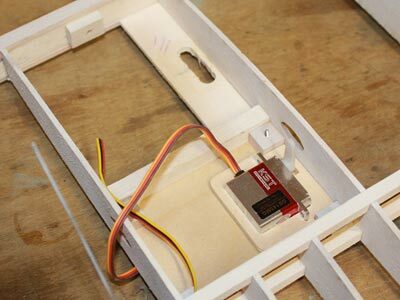 The 10mm fits to the firewall, with space to mount batteries and ignition module. Even able to add / remove weight to fine tune. 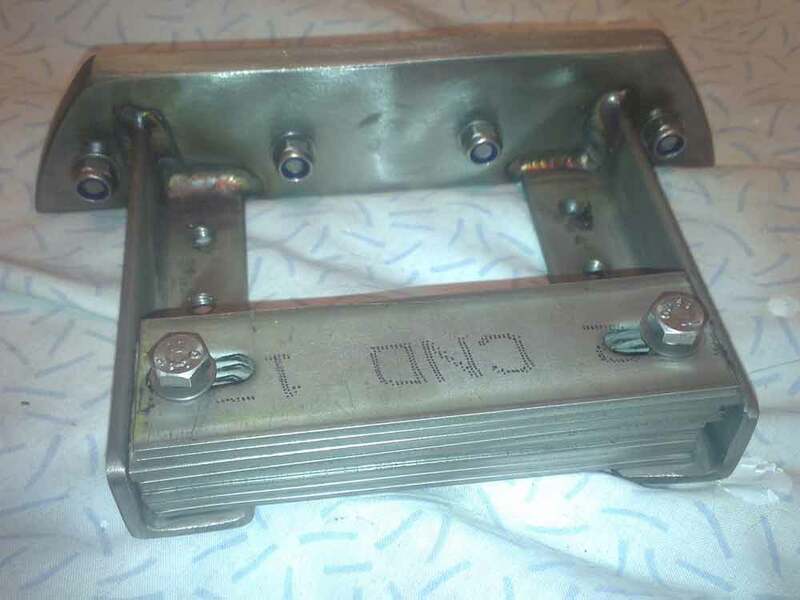 Left image is upside down to show this. 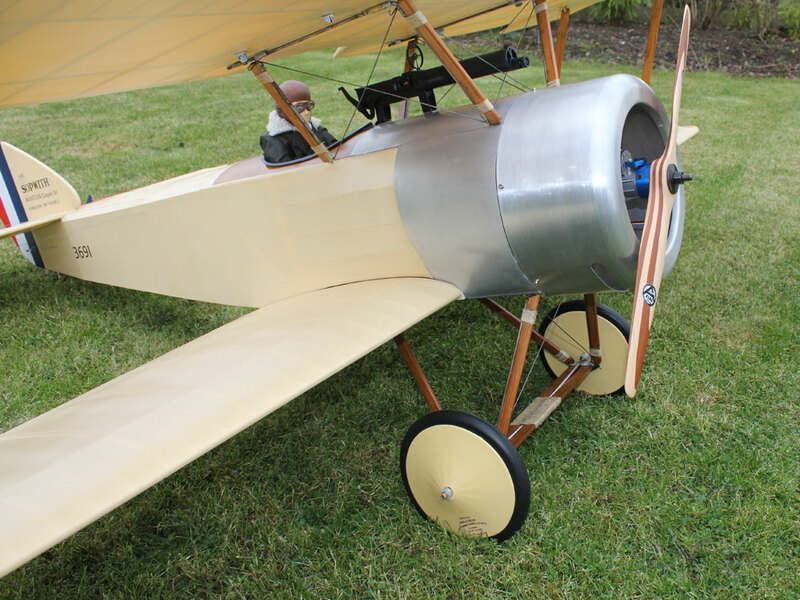 Another change, didn't like the white saddle clamps and self tappers to hold the top wing. 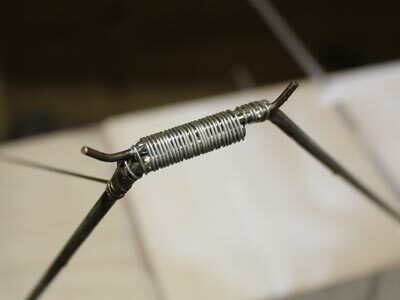 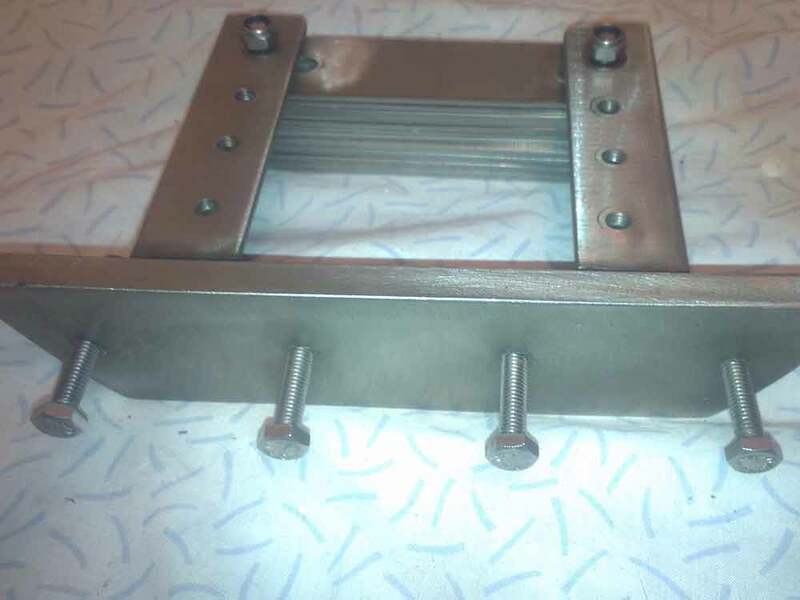 I made these tabs and soldered them to the struts, with captive Tee nuts in the centre section. You can also see I've started the front section litho plating. Poor mans rib stiching, well no real stiching, just strips of rib tapes torn from the roll. 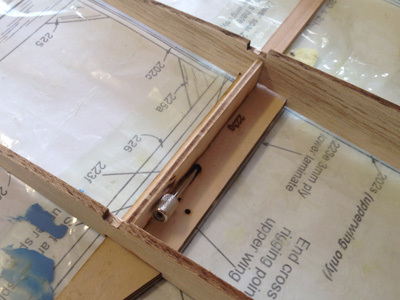 Ailerons hinged with Robart pin hinges secured with gorilla glue. One of the first things the instruction say to do is build the ailerons and fit the horns, trouble is this makes chamfering the LE difficult as the horn is in the way, I waited and as you can see fitted the ailerons and got them to match the wing profile, then turned my attention to the horns. So now I need a jig. 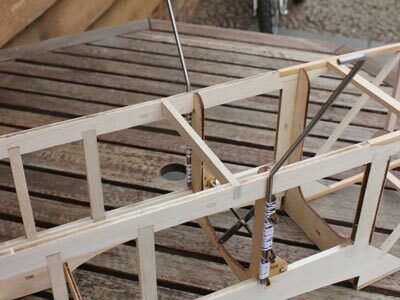 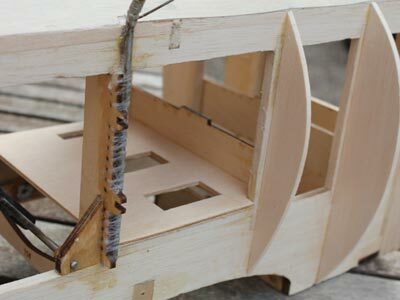 A simple arrangement with the horn locked in place and the rear of the jig on the TE and the top of the horn against the LE made sure all horn were in the same place. 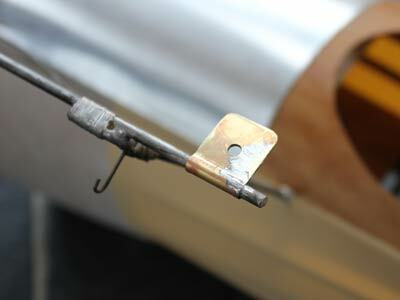 A few drops of cyano to tack in place. To be honest the cyano was probably enough, but I syringed some low expanding Gorilla type glue to make sure. 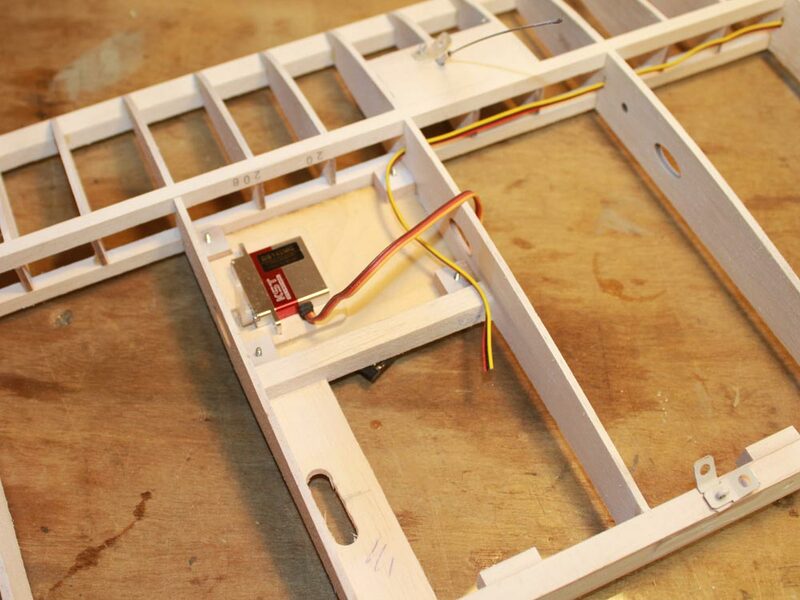 Servo test fitted to get the run (and holes) for the aileron control rods. 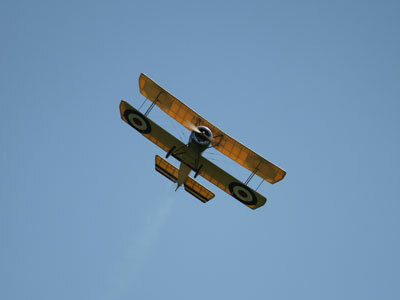 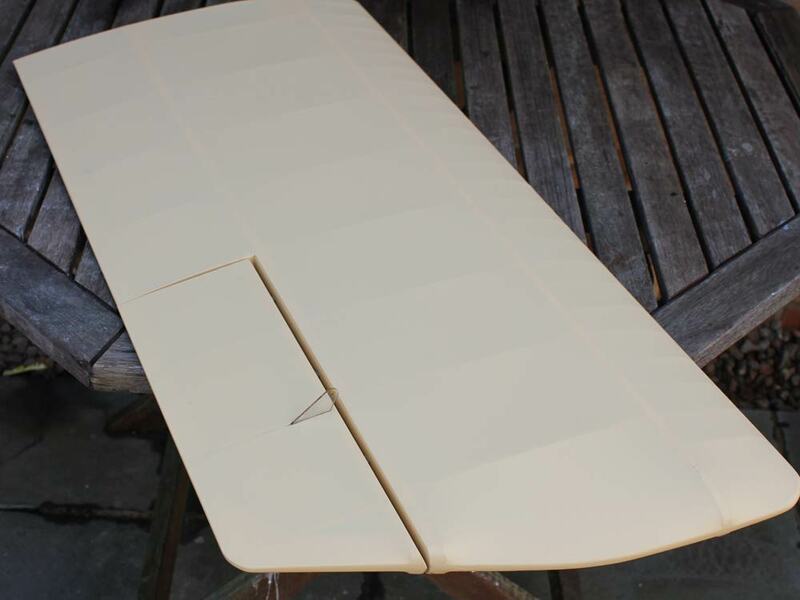 Tail and top wings covered in Mick Reeves Linen coloured solartex. 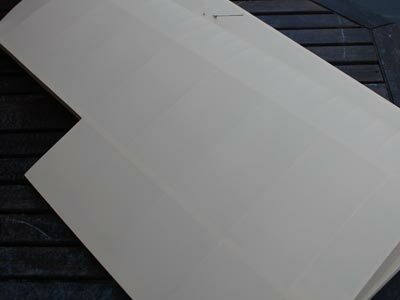 Notice no uneven colour showing through the covering. 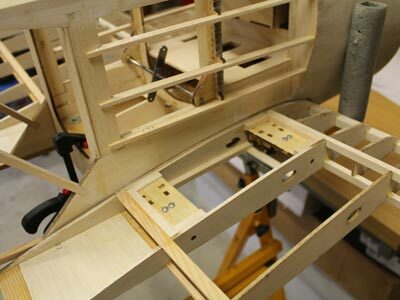 Routing of the control cables for the elevator & rudder control wires. 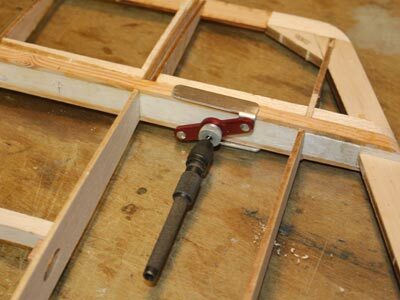 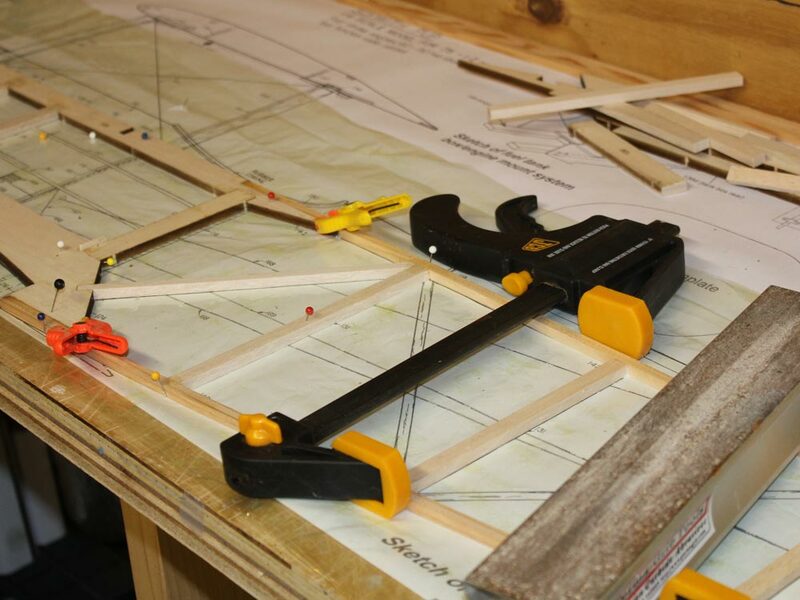 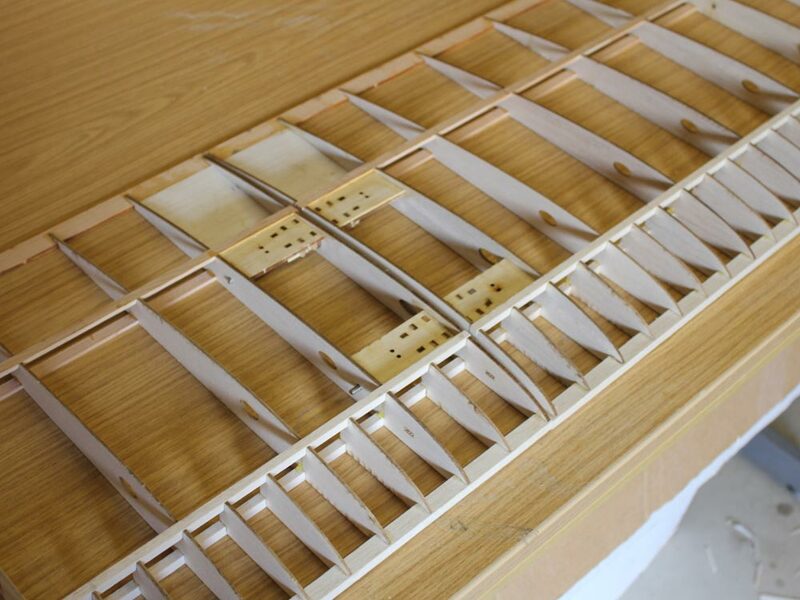 Before separating the ailerons, drill for the hinges. 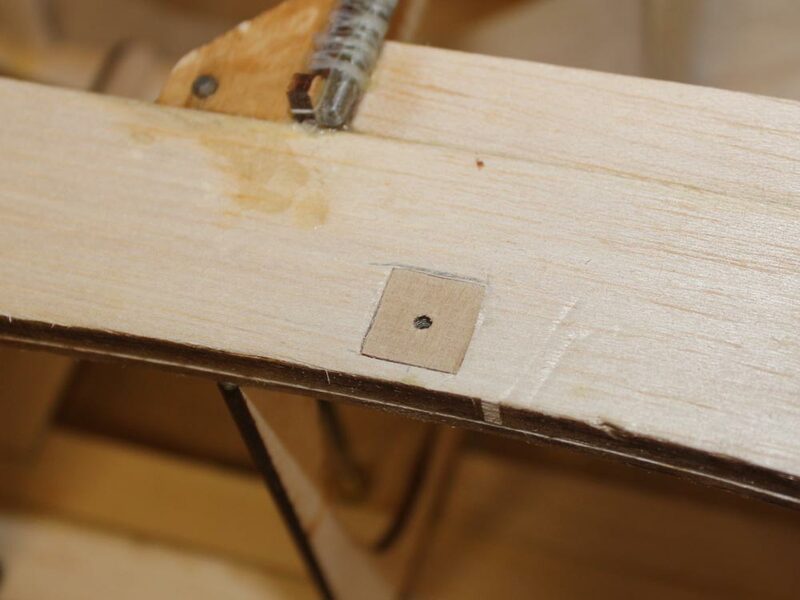 I prefer to use Robart hinge points, excellent hinges and as you can see dead simple to get the holes drilled and aligned, I have also added some extra wood at the hinge point so there is more material for the hinge to bite on. 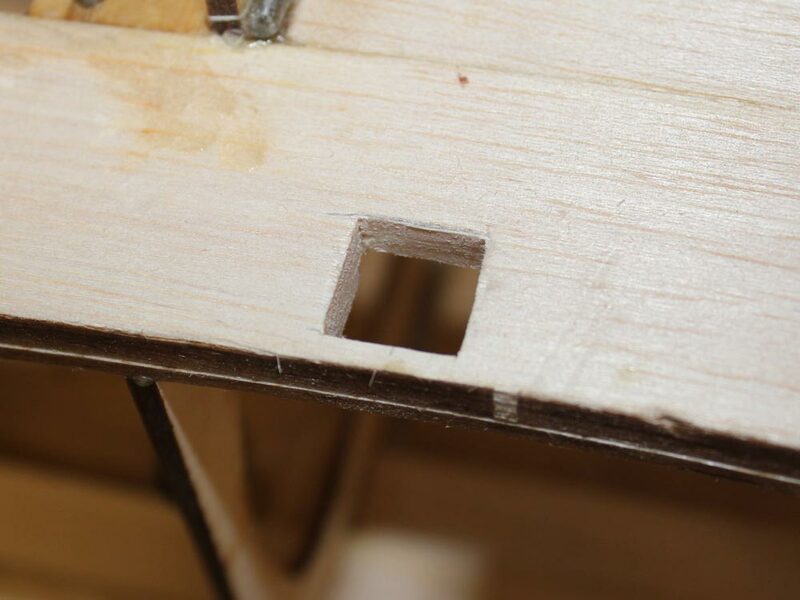 There is a small issue on the plan, its impossible to get the aileron contol run square, the aileron horn is outside the servo well, its only a few mm, but not ideal.This is shown on the plan, with the control run at a slight angle. 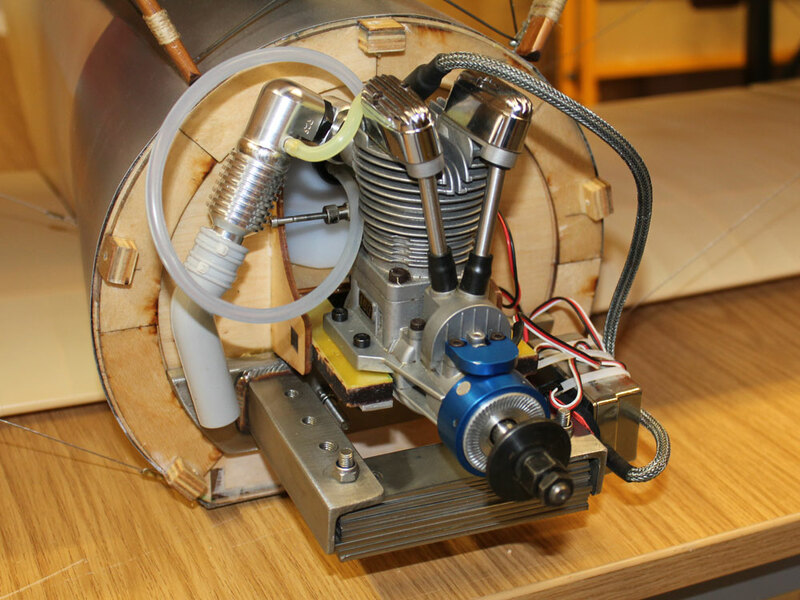 I have added an additional sub rib to move the horn inside the servo well. Looking at the center picture youcan see how a light spray even outs the wood colour to help the look after covering. 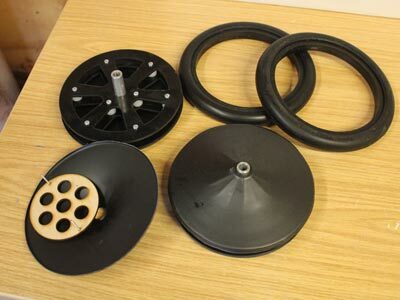 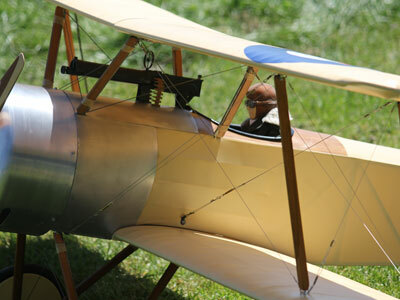 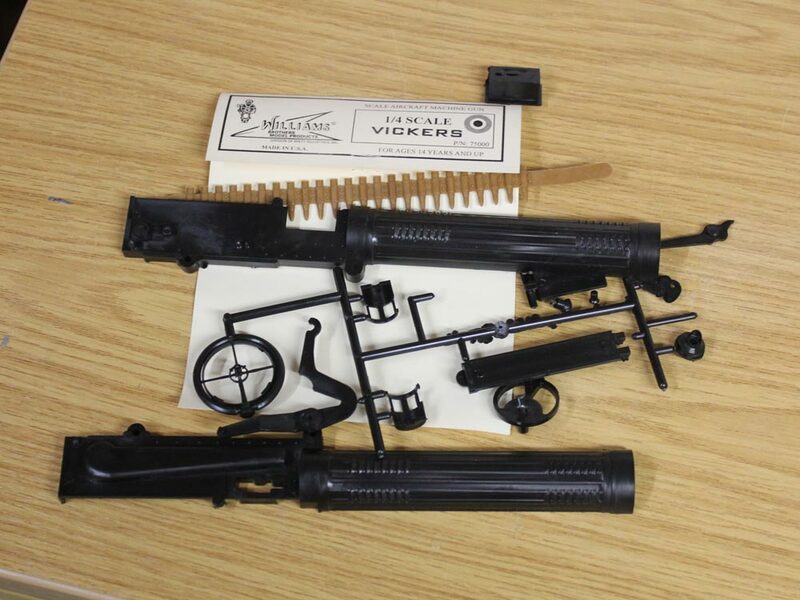 Fin transfers, wheels & Vickers gun also add an air of authenticity. Thought I would treat myself to some supurb scale details. These came from Mick Reeves Models are excellent. 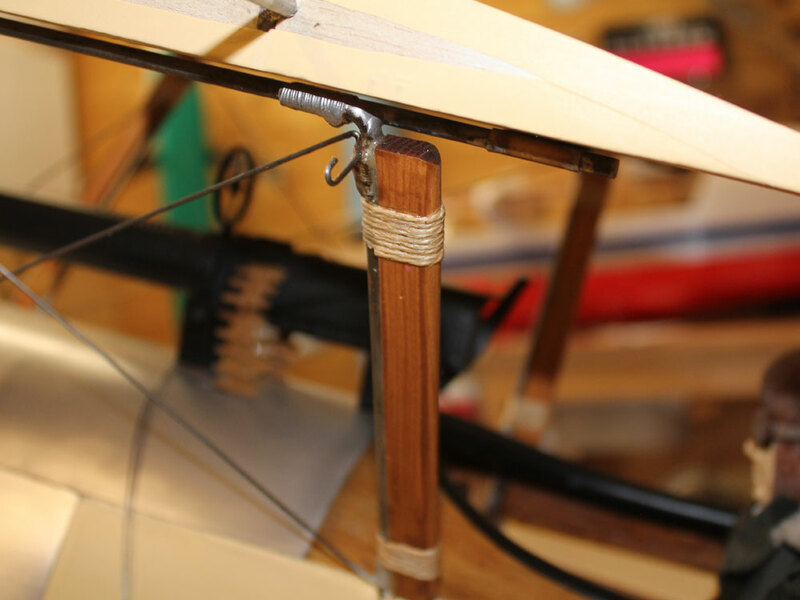 Hardwood dowel inserted at the rigging joining points at the tail. 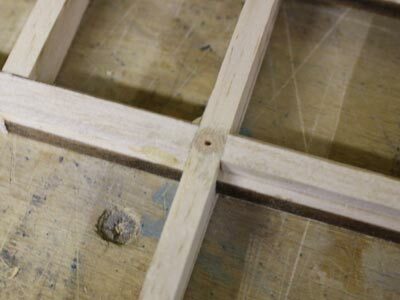 I'm using Mick Reeves Linen covering which is ever so slightly transparent so prior to covering the open wood structure is given a light spray with white primer, this gives an even colour for the covering, helps to hide the different woods and any laser dark spots. This is sanded and given the once over witha tak rag before covering. Undercarriage clamped together, some tweaking of the wire was required, once clamped I tak soldered together removed the clamps and bound with tinned copper wire before final soldering. 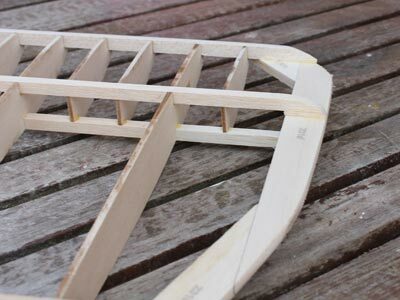 Fitting the lower wing centre section. Don't be temped to fit the centre section and drill the holes, a few mm out here will be a few cm at the tip. 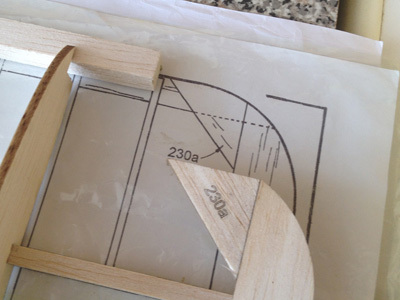 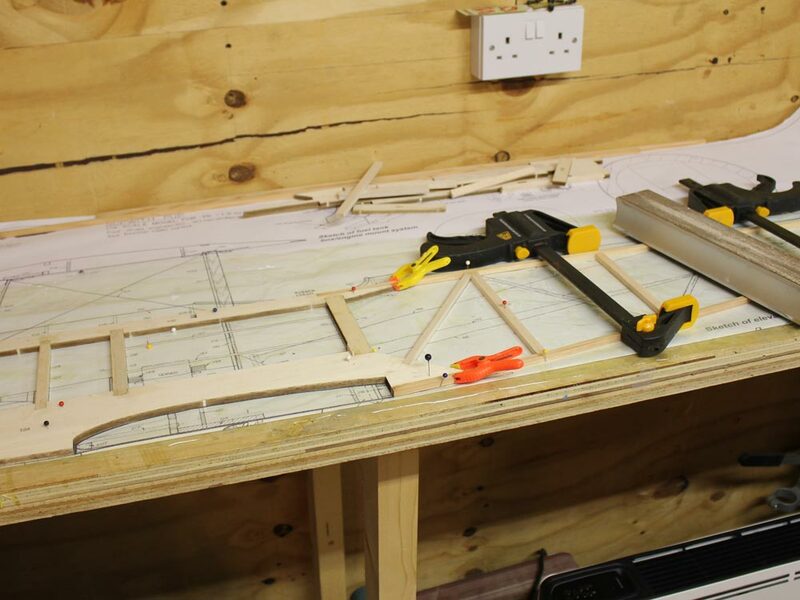 Fit the wings to the centre section and clamp, then take measurements as you would normally do from the tail to tip, clamp , then drill knowing its square. You have to have the bottom centre mount secure before you can start the main undercarriage. Fitting the bottom wing mount showed a small gap. 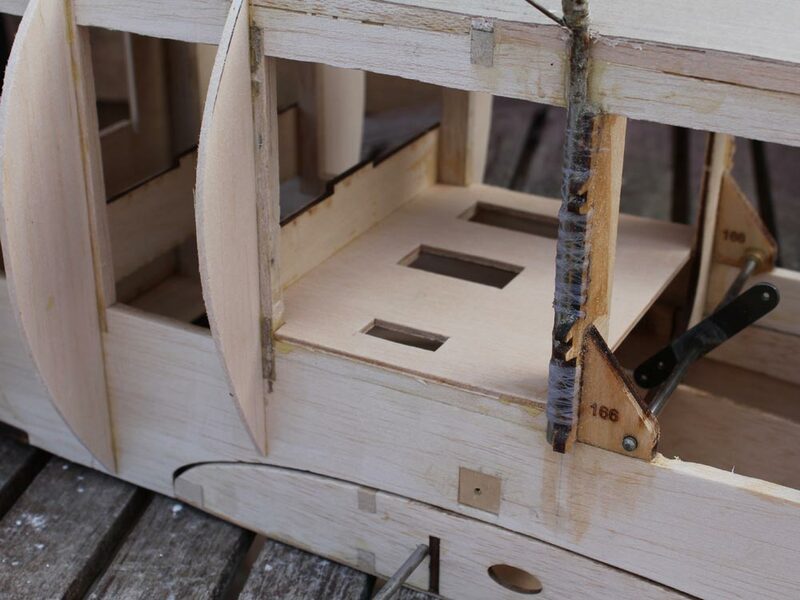 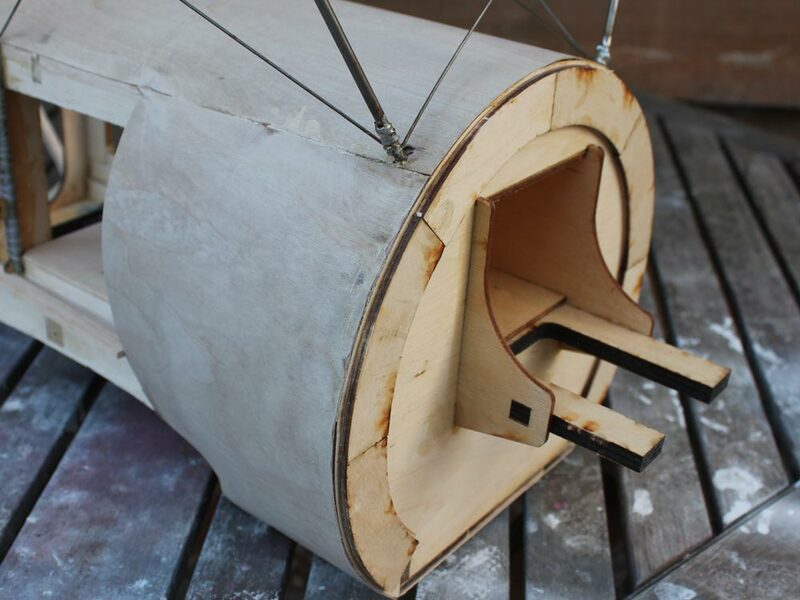 I filled with soft balsa and filler. 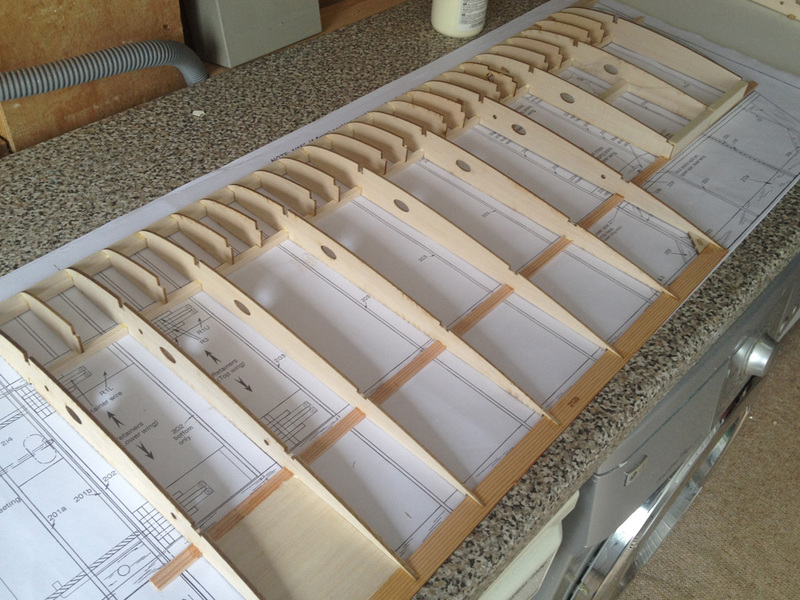 Completely unnecessary I know :-). Side cheeks, still a bit of a fiddle. 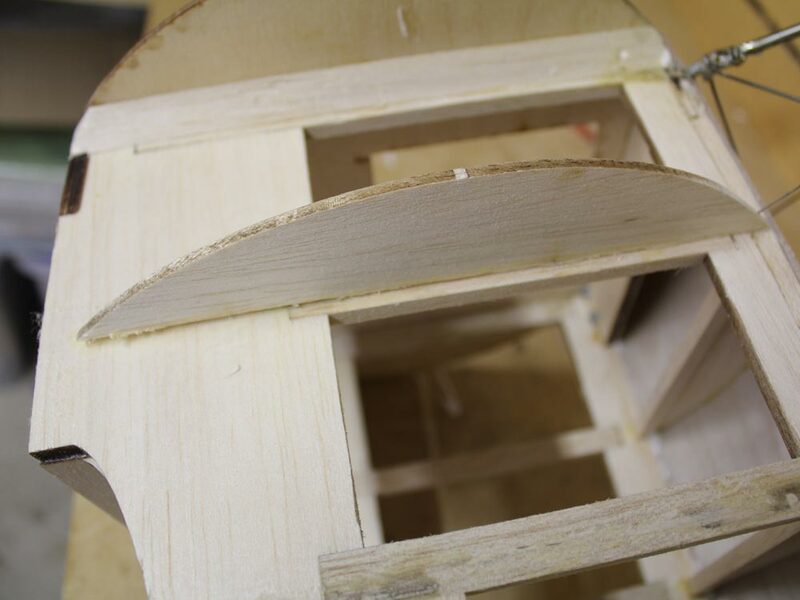 I used cyano along the top edge and white glue for the rest, once dired, I used gorilla glue inside along the top and bottom edges to make sure. 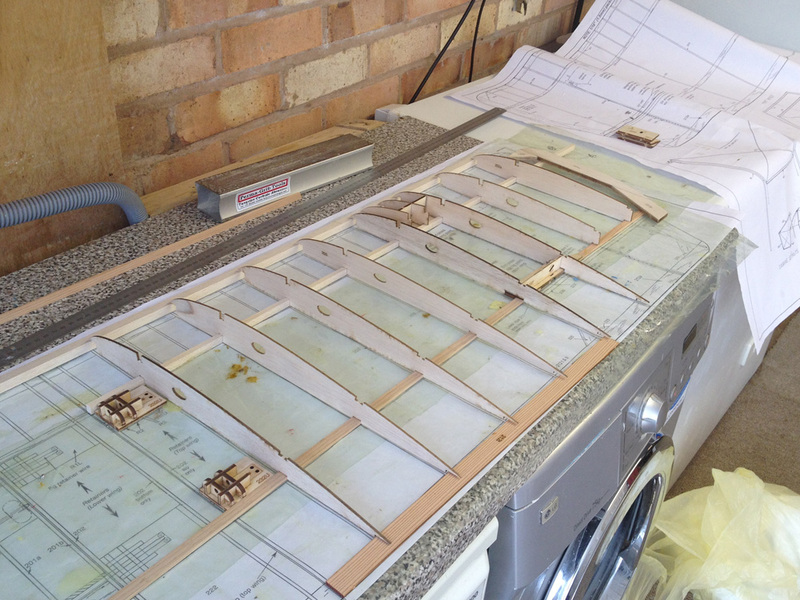 As per the tail, I tak glued the ailerons in place (note they don't have chamfers yet nor have I fitted the horns) and sanded each as a whole. 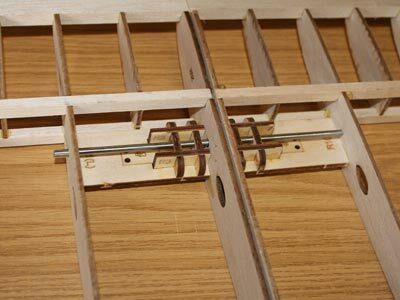 I can then break off the ailerons and chamfer for the hinge line knowing everything is good. 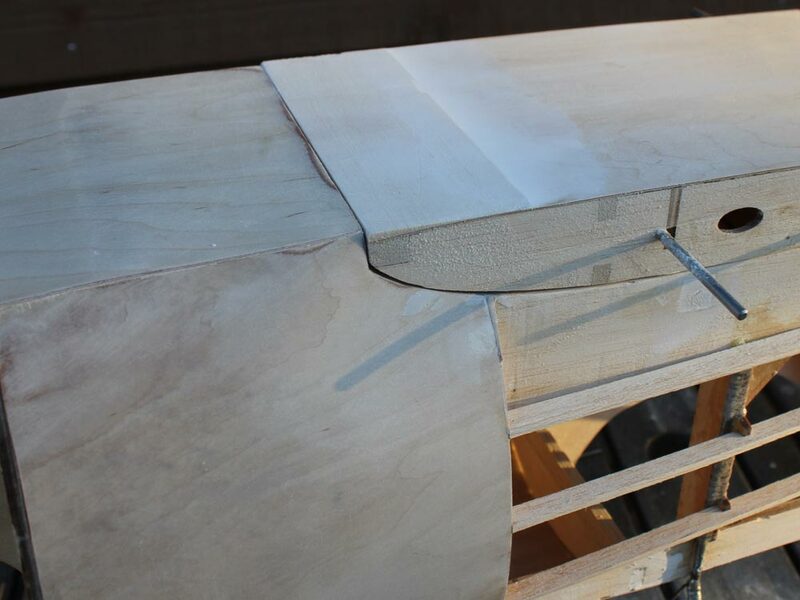 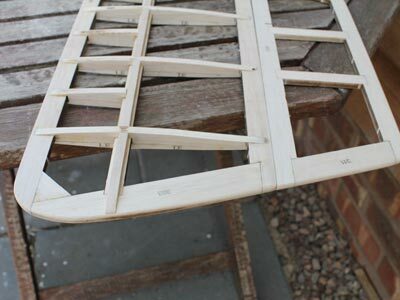 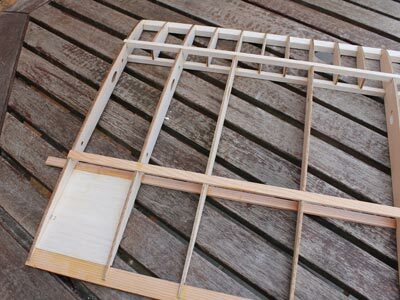 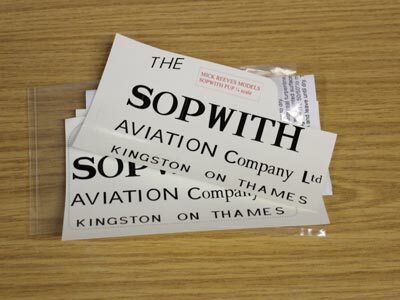 Also don't be temped to round the 1/4 sheet wingtips, you want them to have the same radius as at the spar, so they do look flat, this will be fine once covered. 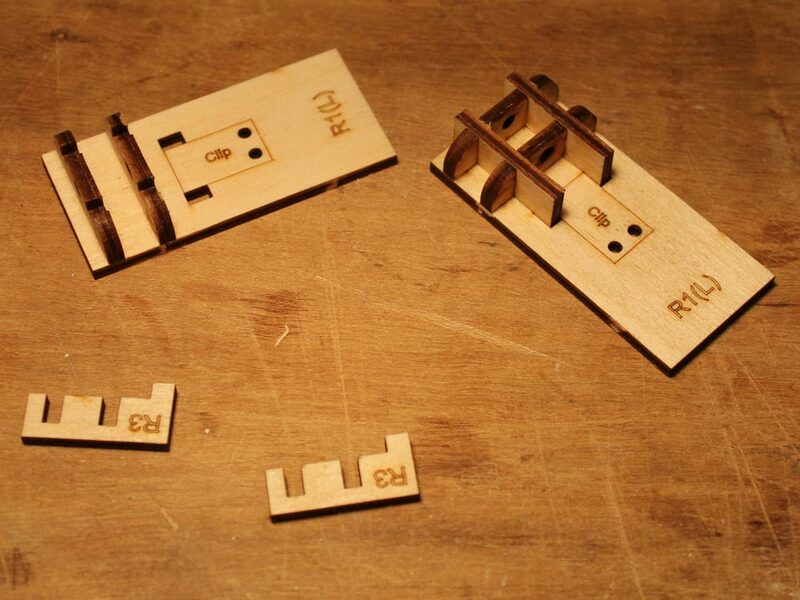 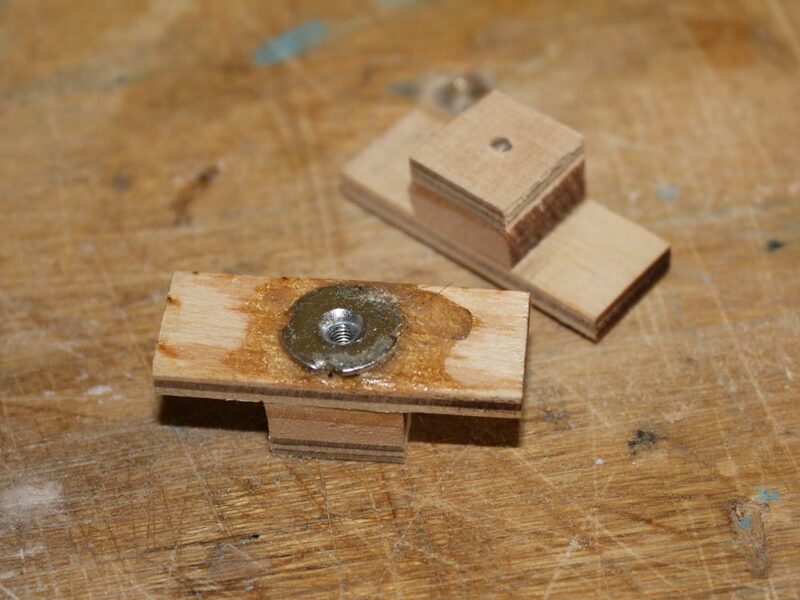 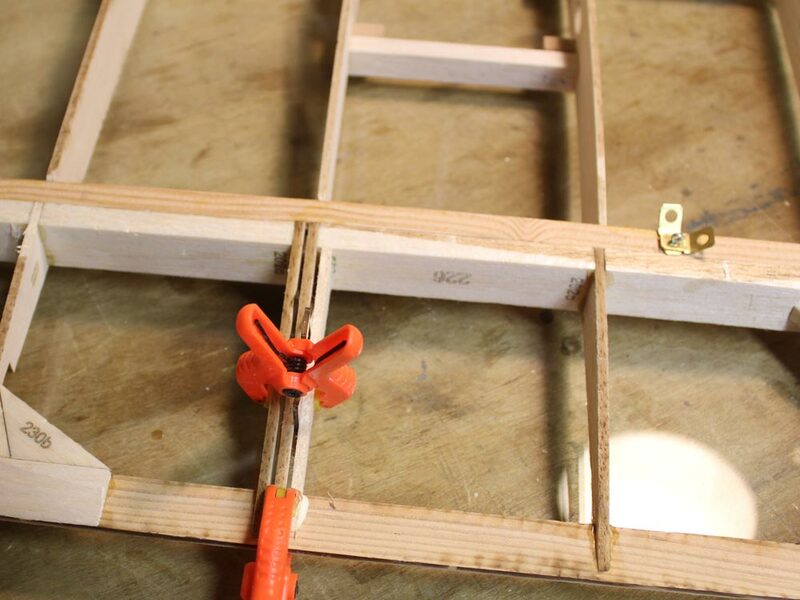 See my sanding jigs, I can fit sticky sanding pads with a variety of radii. 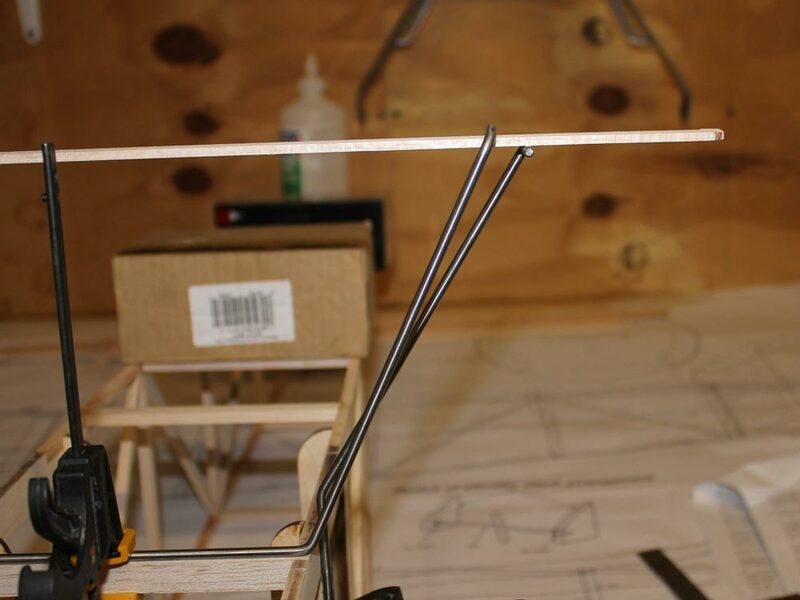 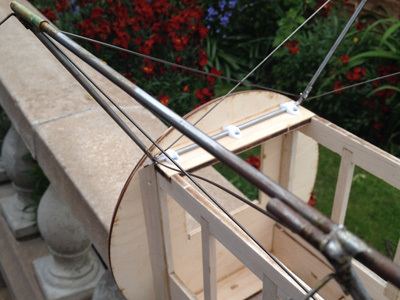 Rigging points and cabane pin. Careful here the rear has 2 whilst the fron only has 1. 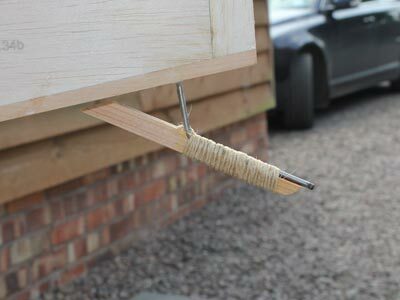 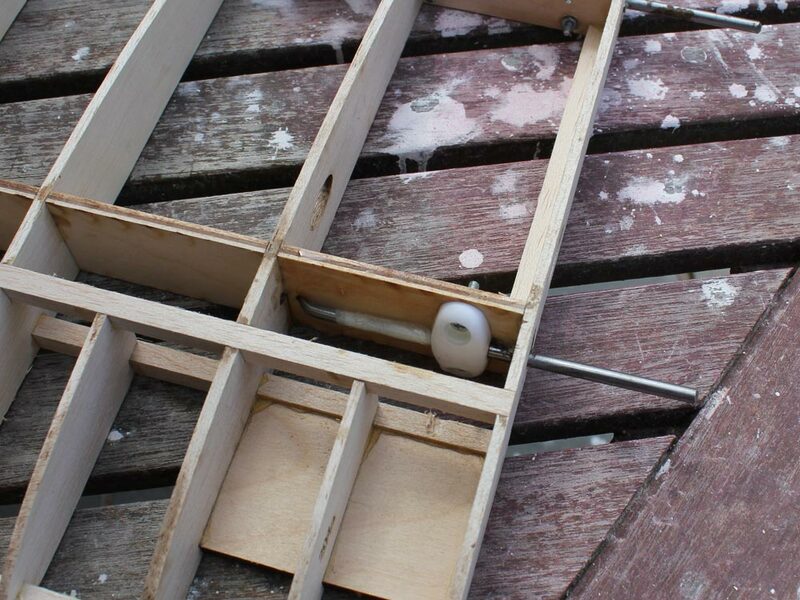 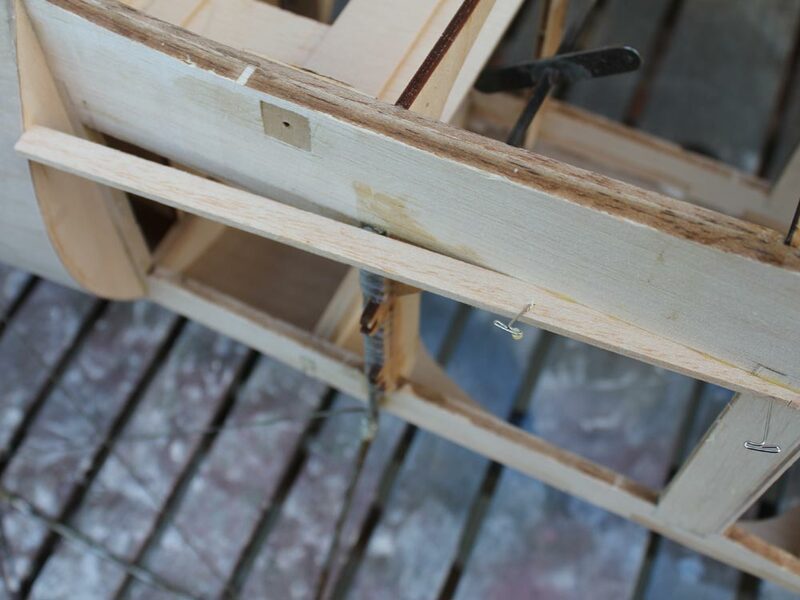 Cabane strut moutning hardware going in, these split pins were fitted after giving the wing a first sand. 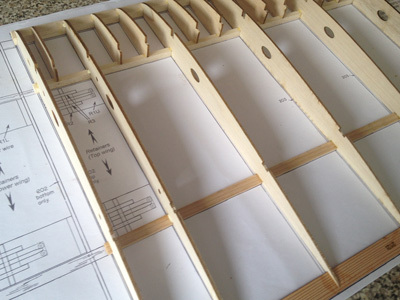 Nothing is shown on the plans for the wing retailing / release tabs. 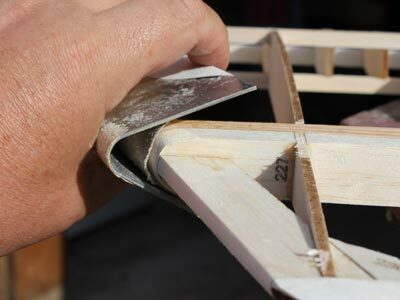 I used some 3/32 balsa with a hole cut with sharpened tube for the tab to poke through. 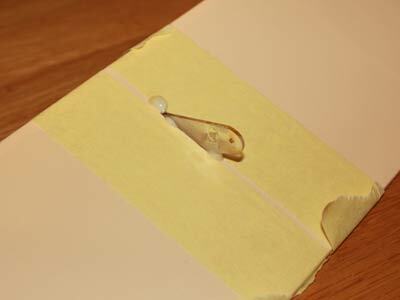 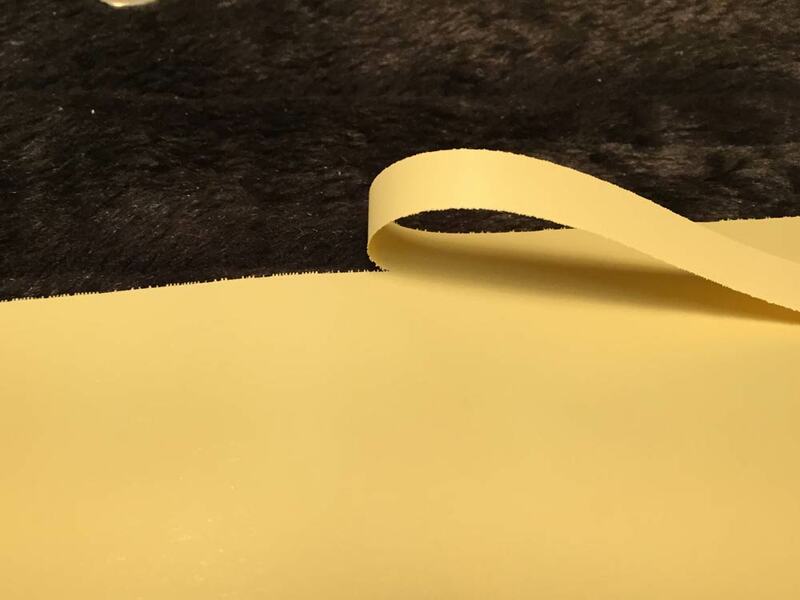 This is needed for the covering to have some purchase around the tabs. 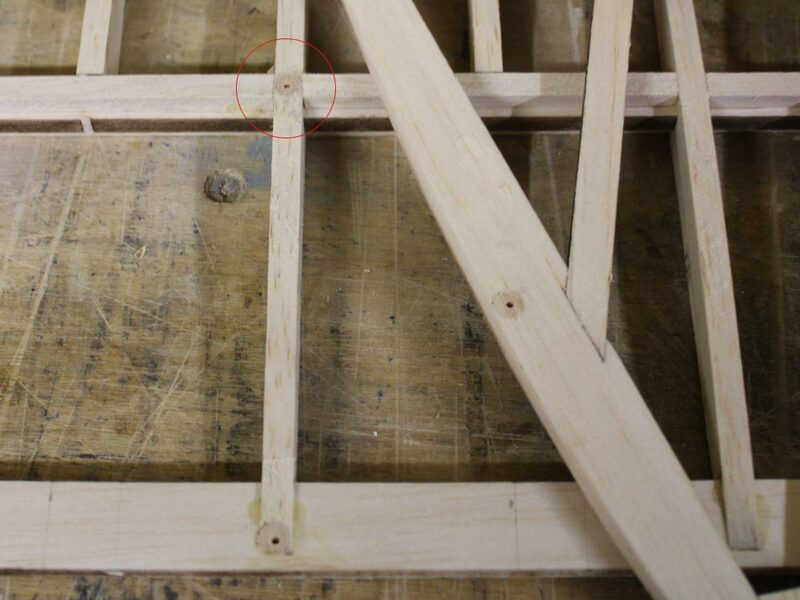 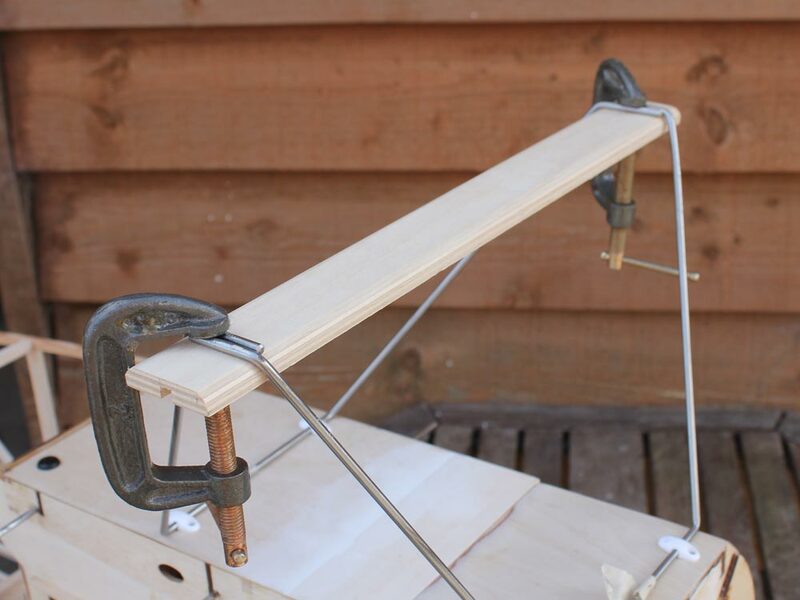 You can see a saddle clamp holdimg the wing joiner on the upper centre section. 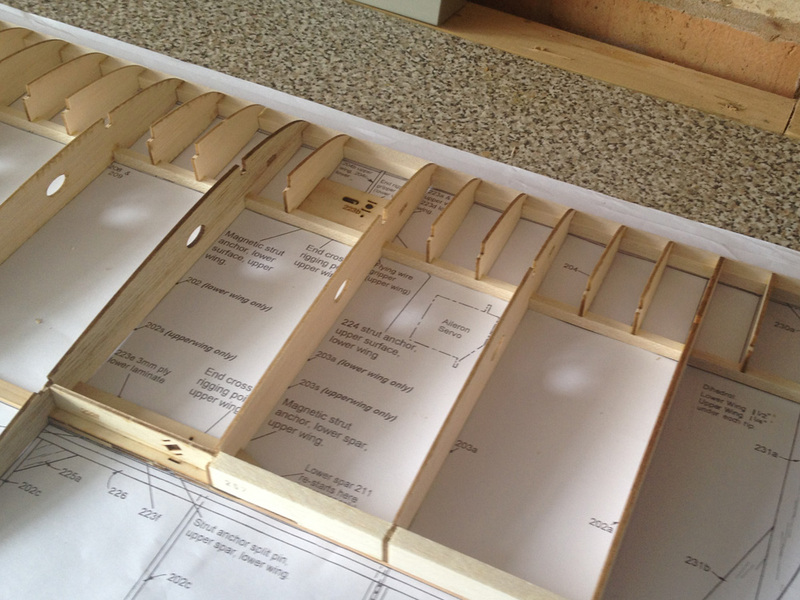 Tailplane / Elevators / Fin & Rudder are all built over the plan. Instructions say to fit the rudder horn as you build, I didn't as this would make final sanding a little harder. 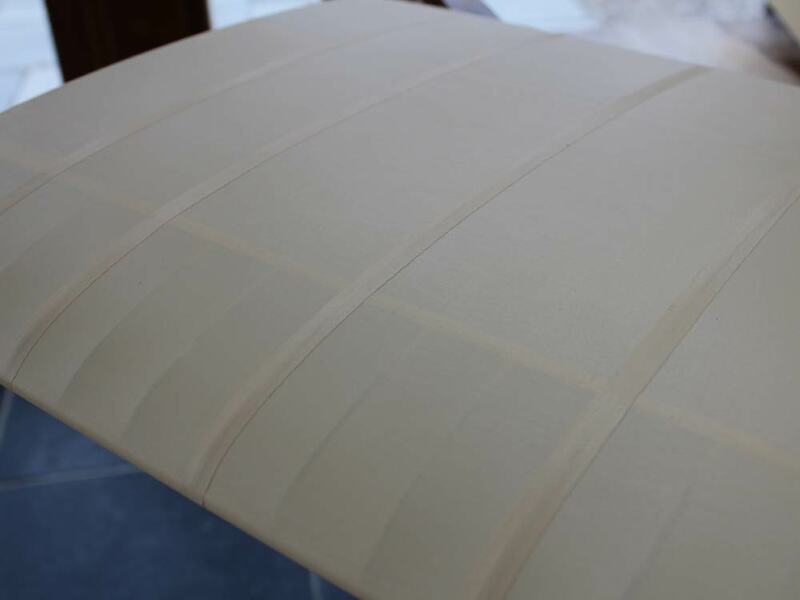 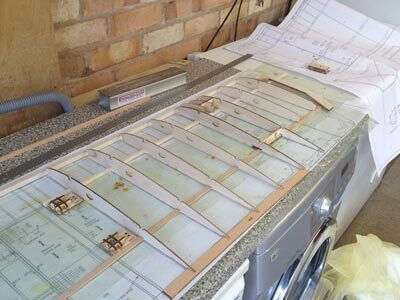 I tak glued the elevators to the tailplane and rudder to fin and sanded each as a whole, this gives a more uniforn fit and finish. 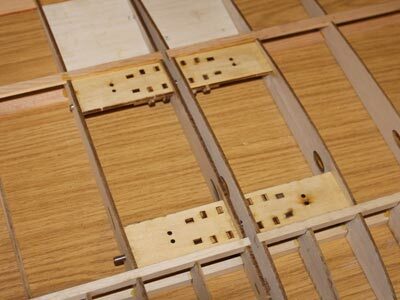 Servo trays are my preference these days, and there is plenty of room to fit your gear, but get the tray in while you still have room to work inside. Good time to fit the tail skid too. 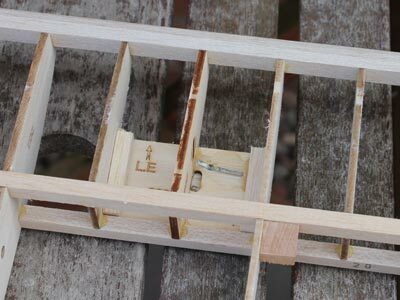 Fuselage rigging point says to screw into balsa, I didn't like this much so extended the inner hardwood out to the fuselage side so there is a hard point to screw donw on. Here i s where I hit my first problem. 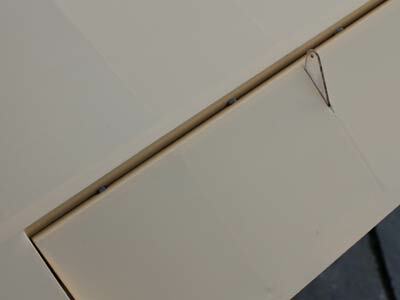 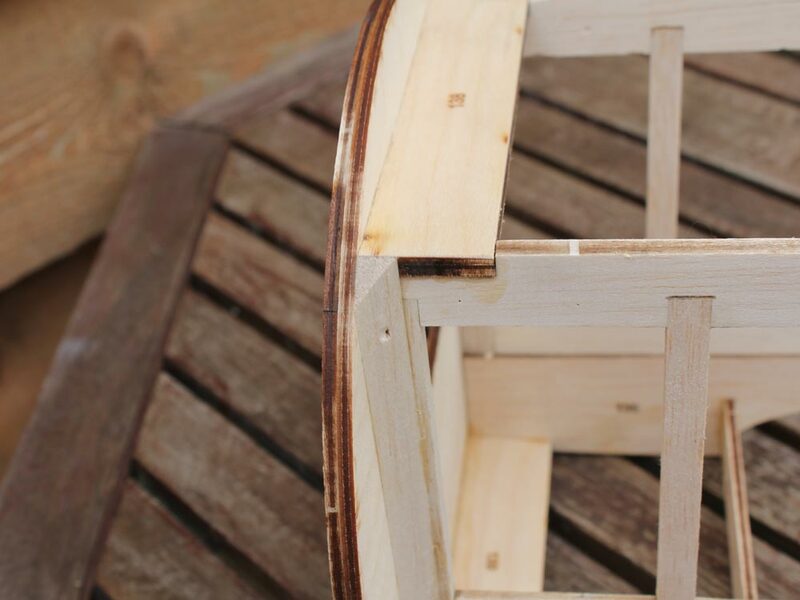 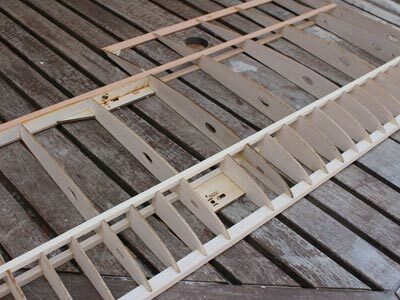 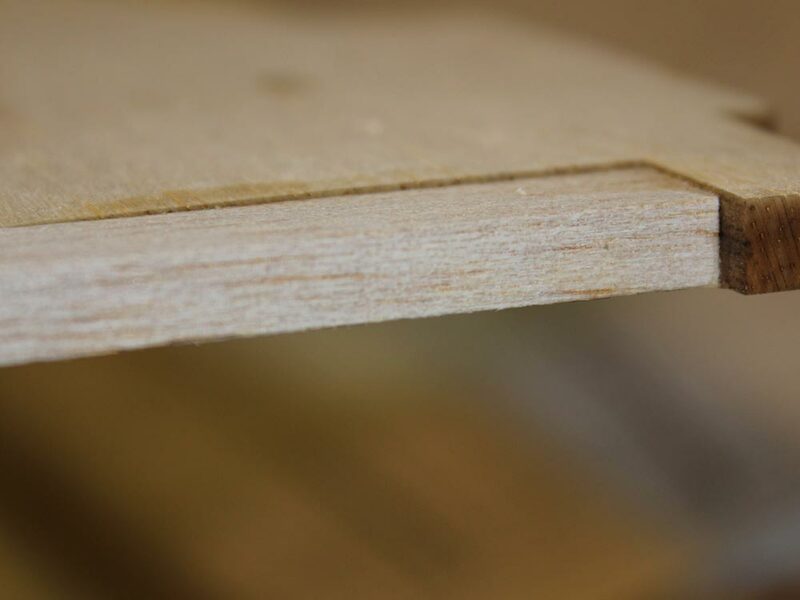 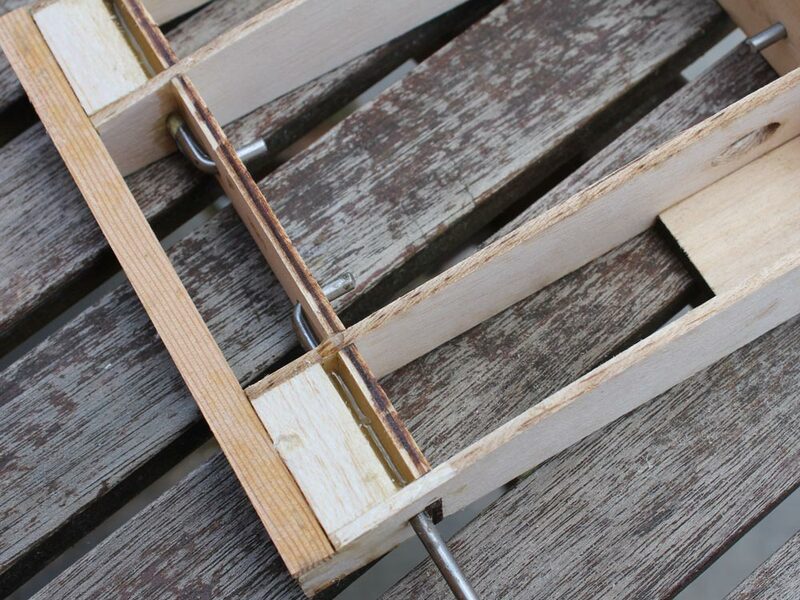 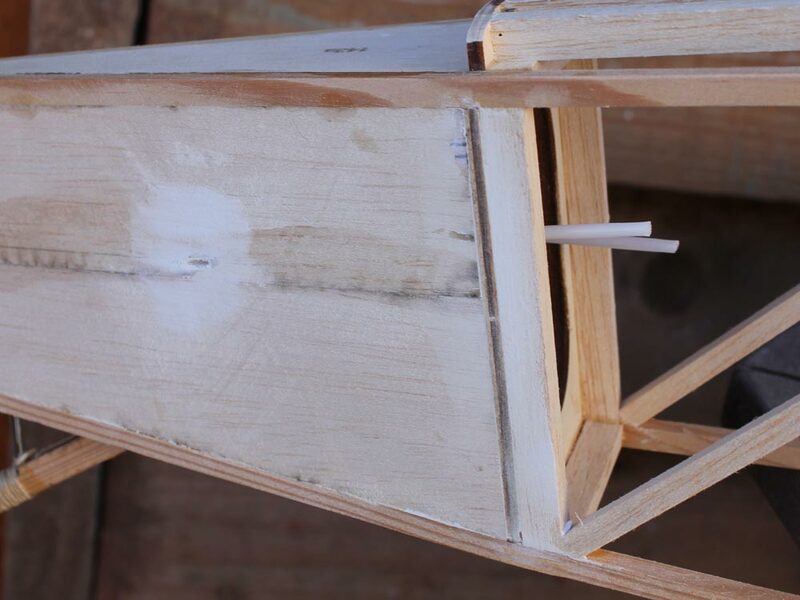 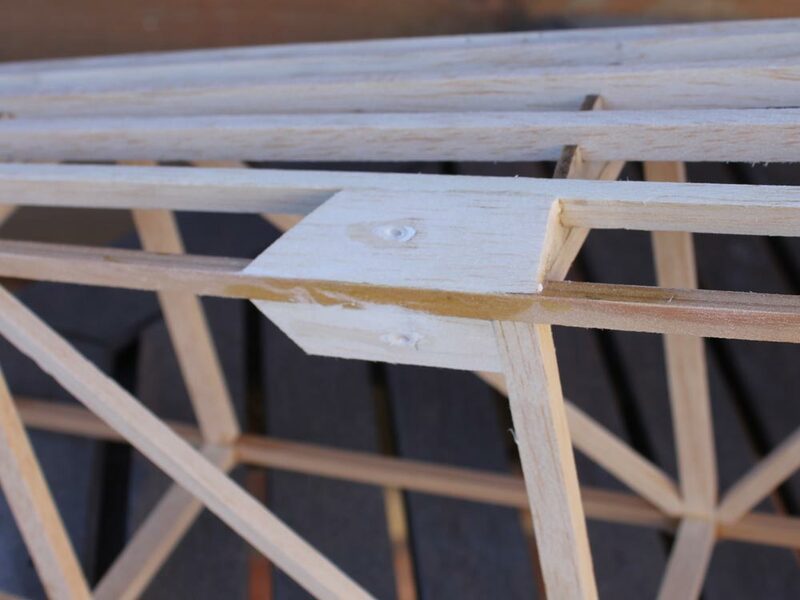 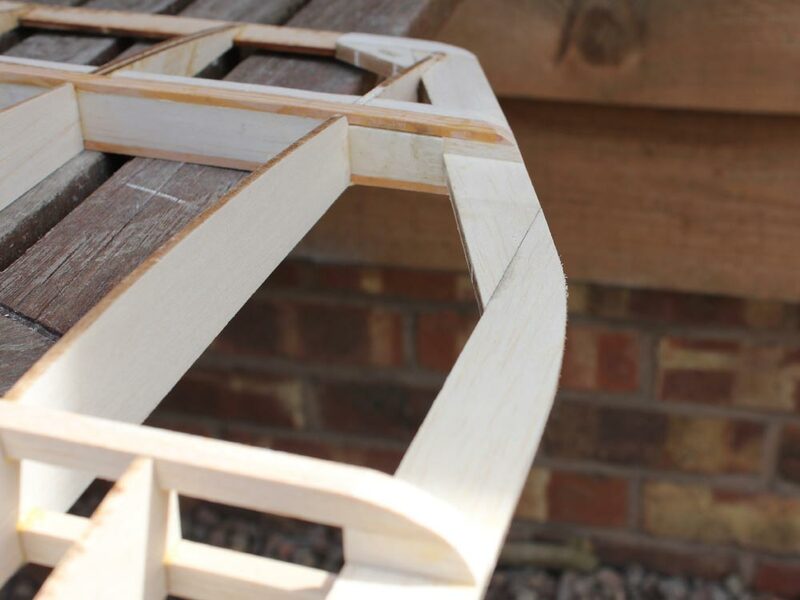 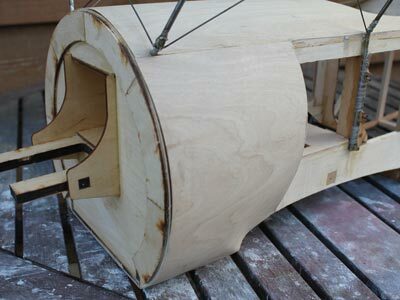 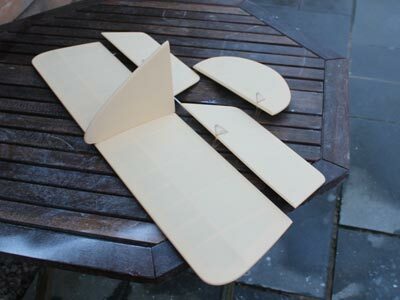 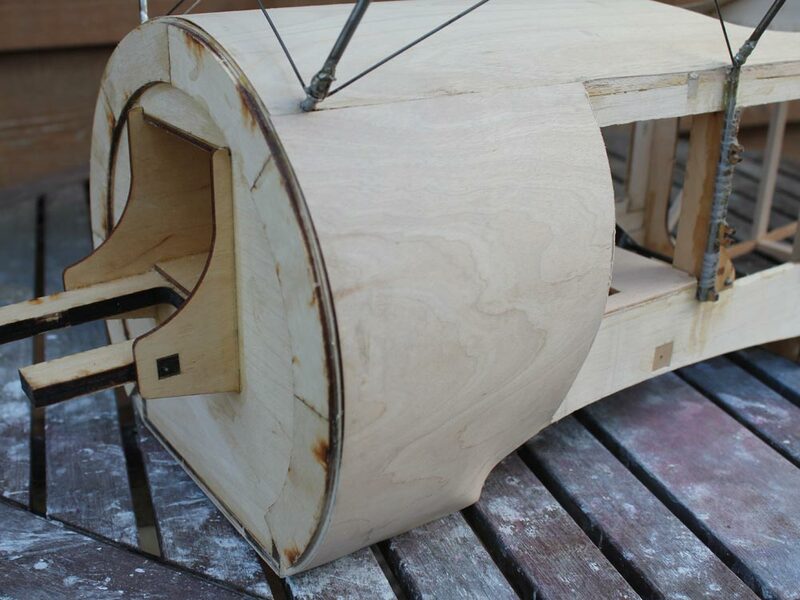 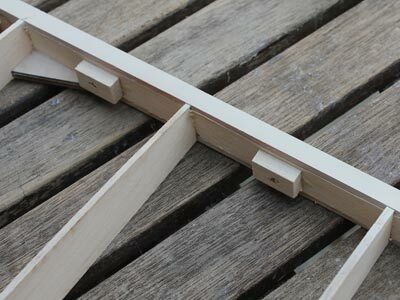 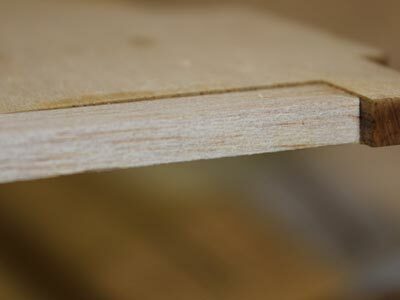 there is wood supplied in 2 sections for the top fuseleage decking, but the joint between these 1/32 sheets of ply are in midair, there is nowhere to glue them to, also I discovered that the radius of the side cheeks didn't match with the natural bend in the ply, and were too short in that they didn't go from the top edge to the bottom of the fuselage side. Cutting the cockpit hole from the pattern on the plan give more wriggle room when fitting. 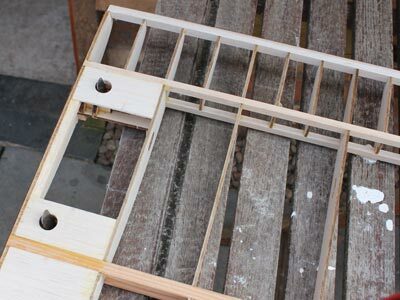 For the top decking I purchased a single piece so there was no join, I thought this would be easier that fitting a former to join to and hiding the joint for covering. And I remade the side cheek formers to give a slightly better fit to the sheet. These are the wing joining brackets, these have to be flat as the dihedral is in the centre sections, to achieve this I cut some 8swg wire (or was it 6) and with the wings flat, glued the mounts in place. 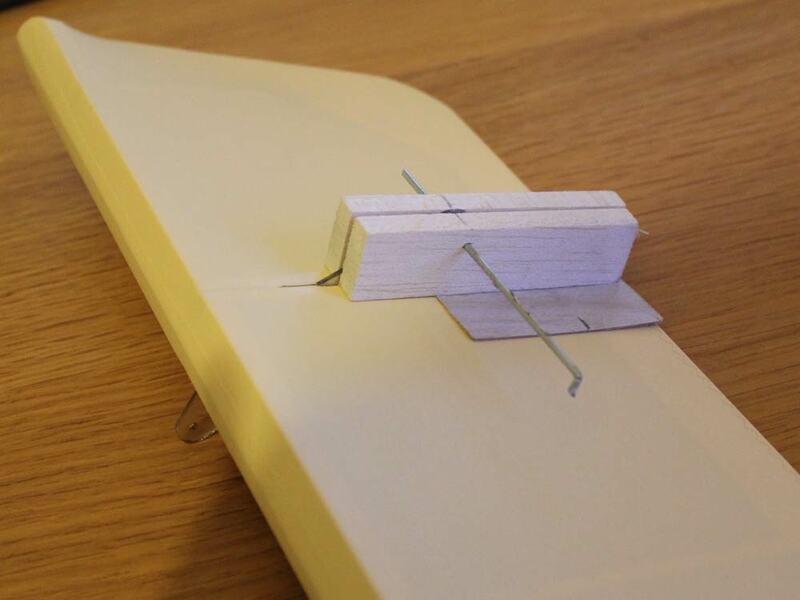 The wires were long enough to go through the ribs so there was no chance of getting it wrong. 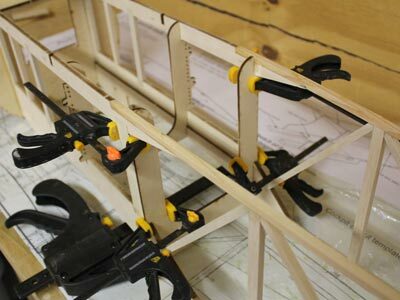 Centre sections built over the plan, I have used a combination of masking tape and epoxy as per the instructions and saddle clamps to hold the wing joining wires in. Not sure if I've mentioned this before, but take your time and build it flat. 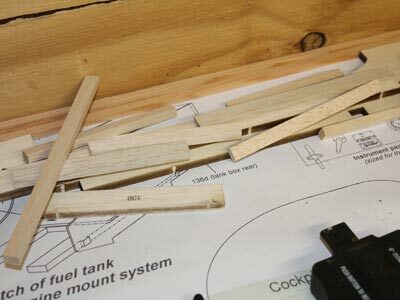 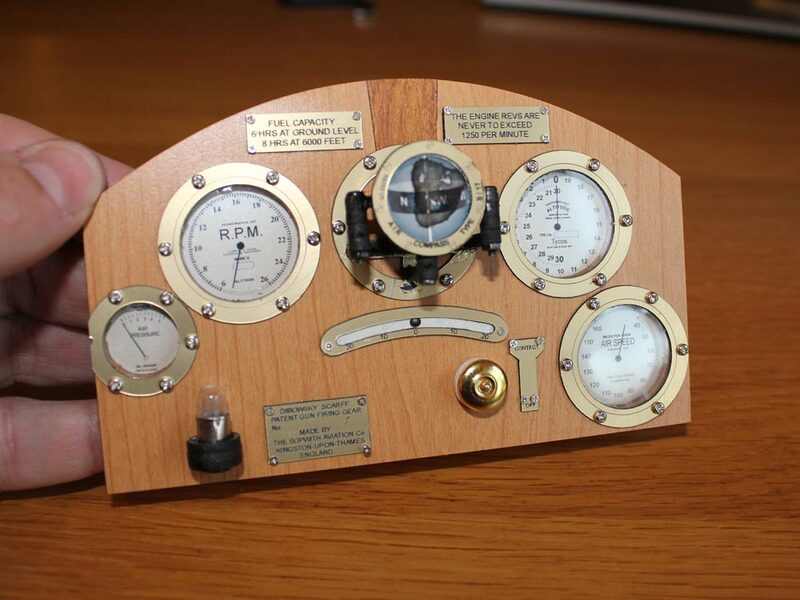 here are some build shots, if you build this kit and get stuck, one of these may help. 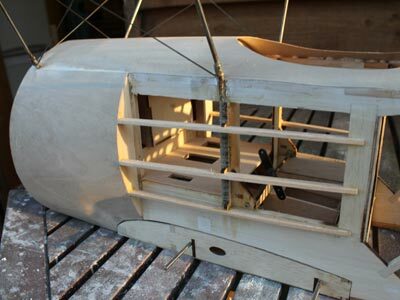 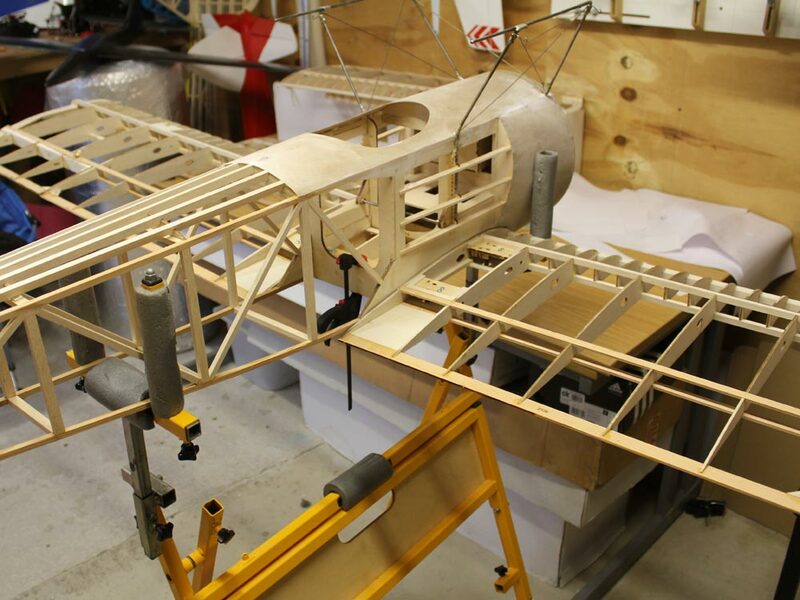 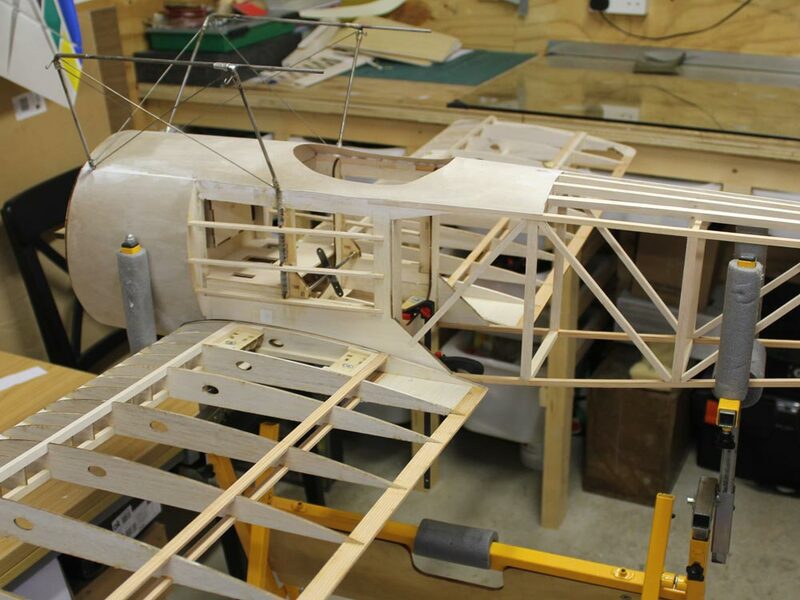 Blocked in the TE, except where the wing rigging goes, this will be done once the hardware has been fitted. 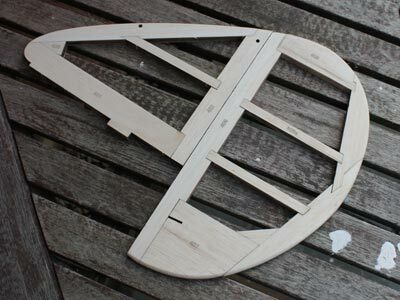 For now its more important to keep it flat. 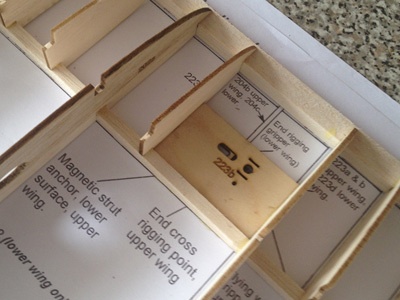 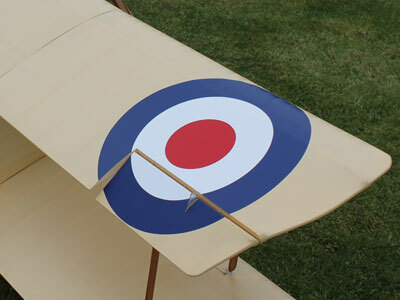 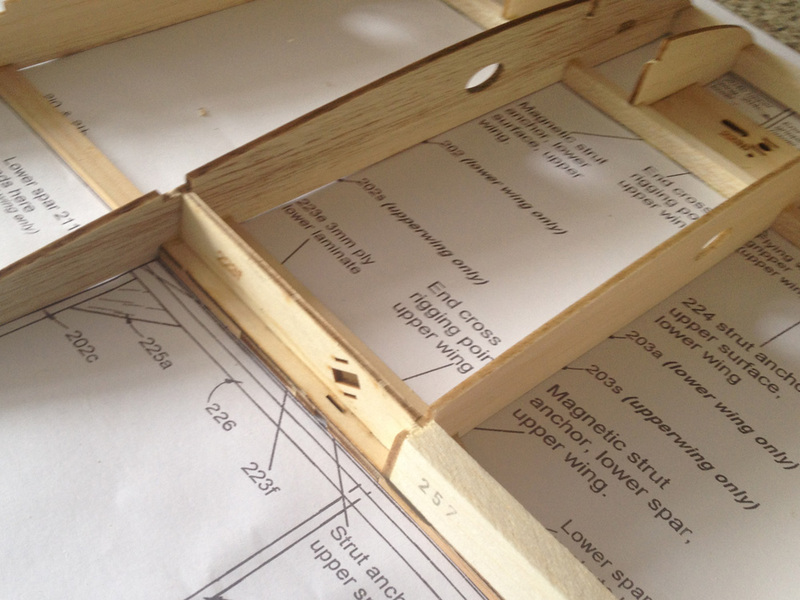 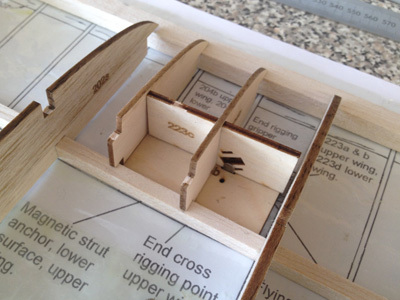 Wing tips not matching the plan or wood supplied in the kit. this is how I completed the wing tip, the 1/4" gap between the 230a gusset and the LE stock was filled with come scrap 1/4 and blended in (see later). 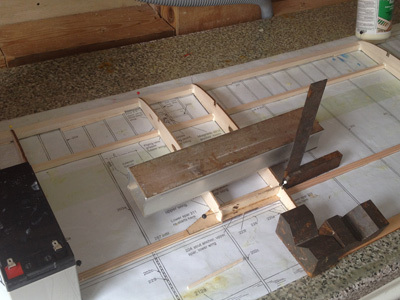 Just keep everyting plan and square, and did I say - take your time. 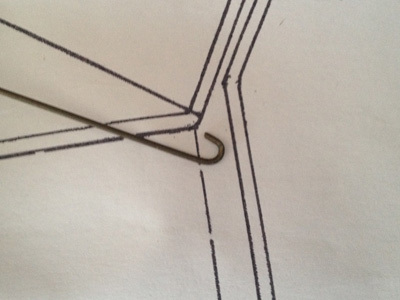 Some areas in the instructions aren't too clear, so follow these pics with your instructions and you will soon figure it out. 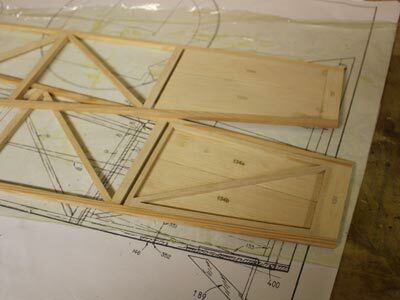 Wings built over the plan, nothing to difficult here except follow the instructions and take your time. 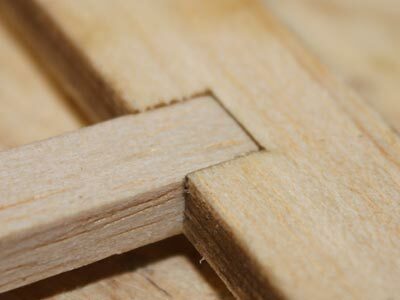 The wood fit is excellent. 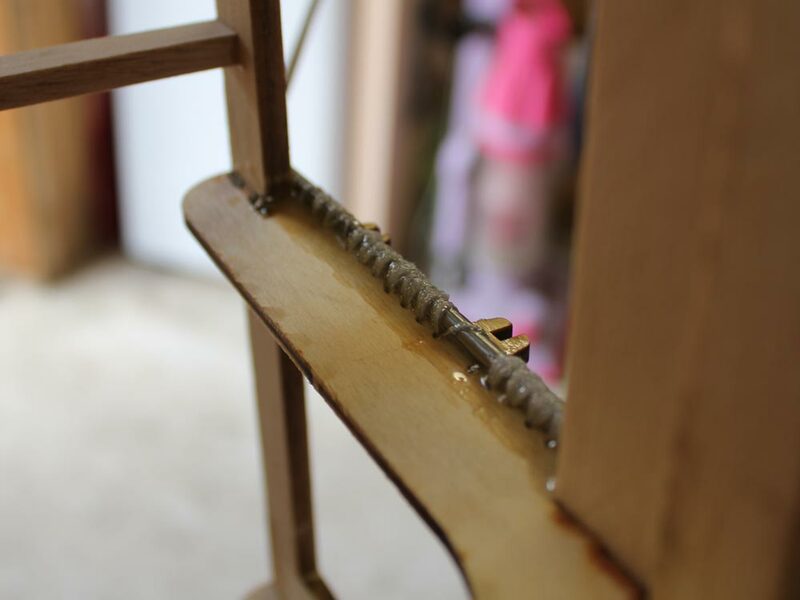 Binding soaked in 60 min epoxy. 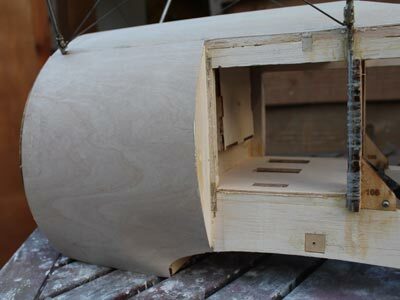 Don't use anything quicker than 60 min as it needs to soak in. 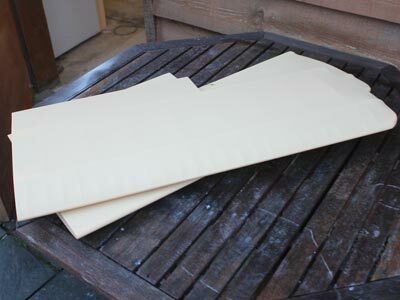 Gengle heat from a film gun make sit runny enough to flow. The cross braces I bent the end into a hook to make soldering a tad easier. Top wing struts, some gentle re bending of the wire was required. 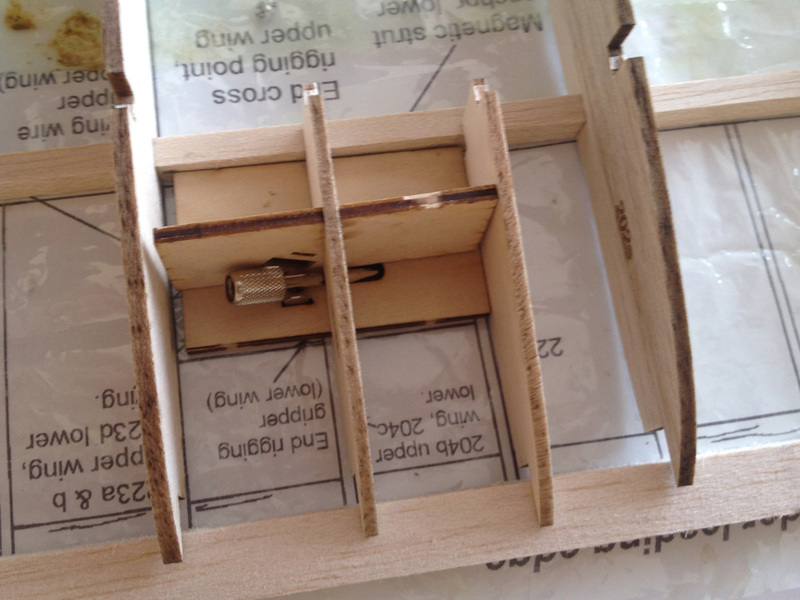 The rear wire is 3mm lower than the front, I used a piece of 1/8 and made sure it was level with the fuselage top. 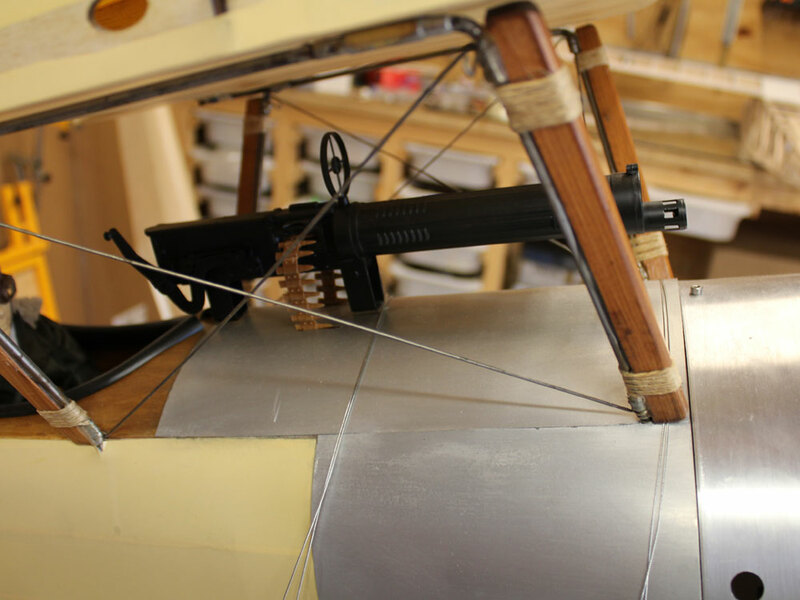 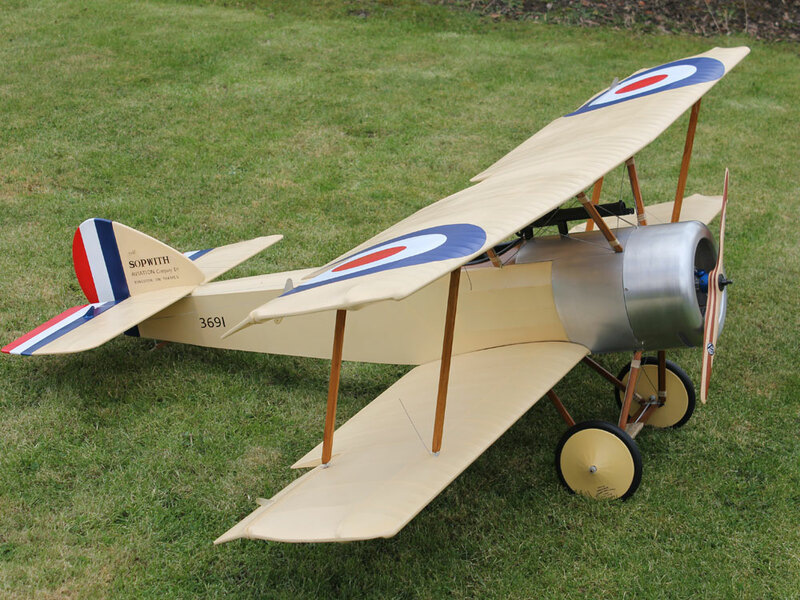 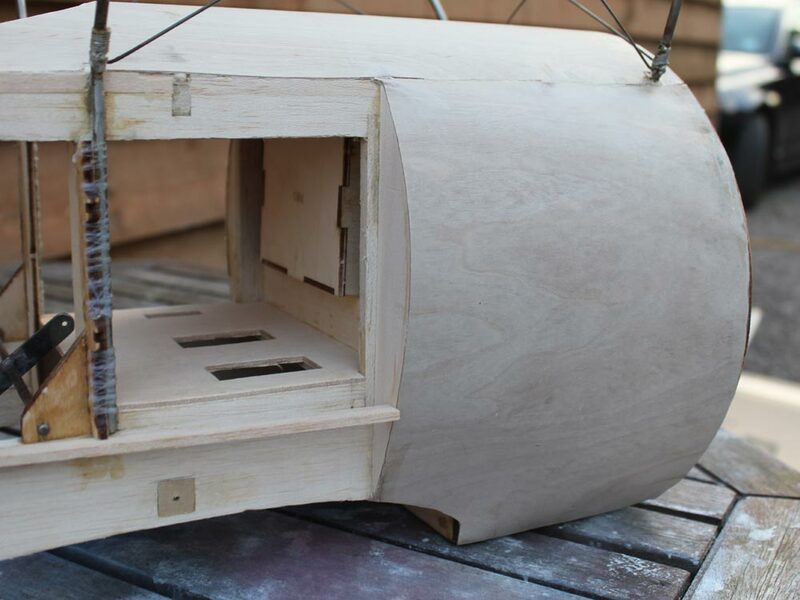 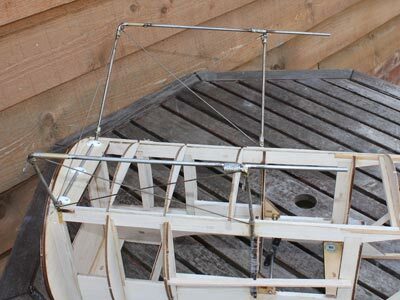 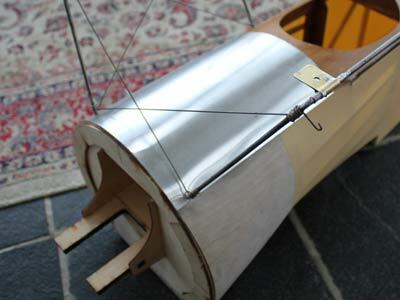 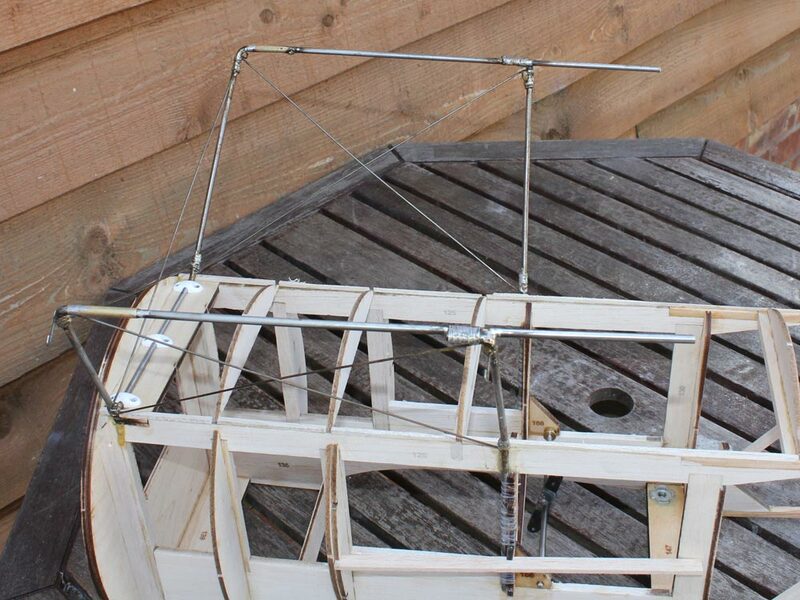 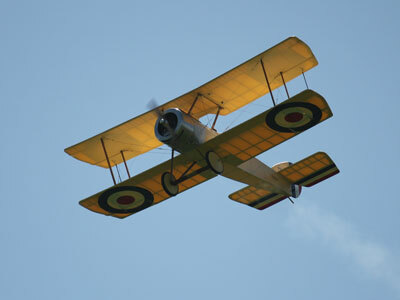 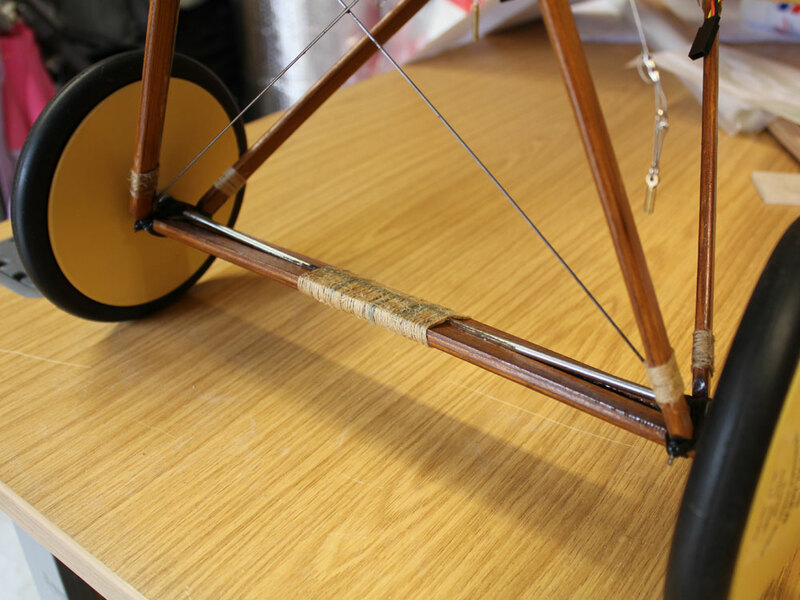 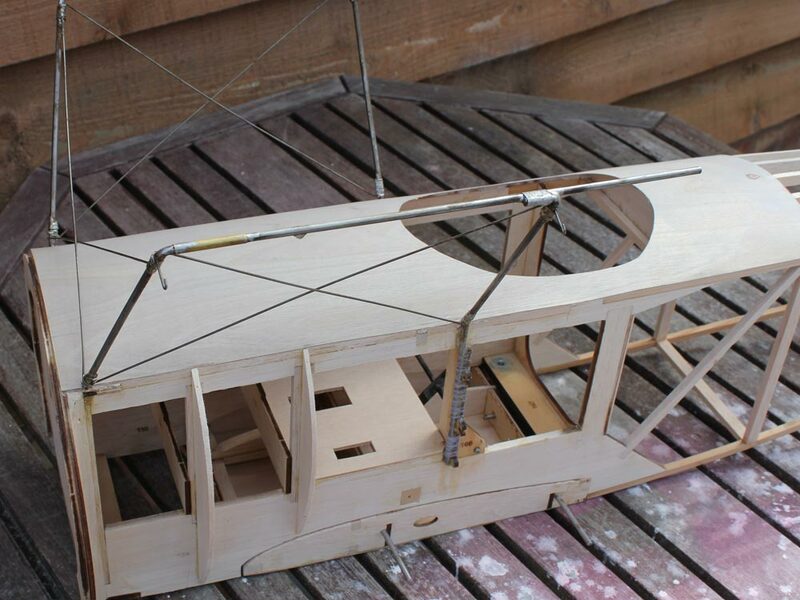 There was no cord supplied in the kit so I used cotton thread to bind the rear strut to the fuselage. 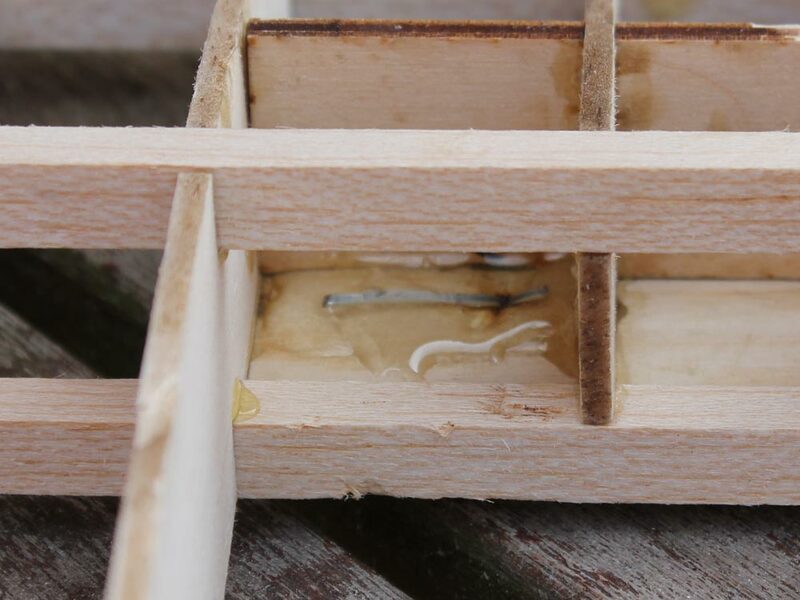 Before final binding and solering I tac soldered the cabanes in place, made sure it was all square then went around each joint and bound tightly with tinned copper wire and soldered. Clean joints and a hot iron are whats needed here. The fuselage is a big box, and as such is easy to get and keep square, I didn't feel the need to use the fuselage jig, just took my time. 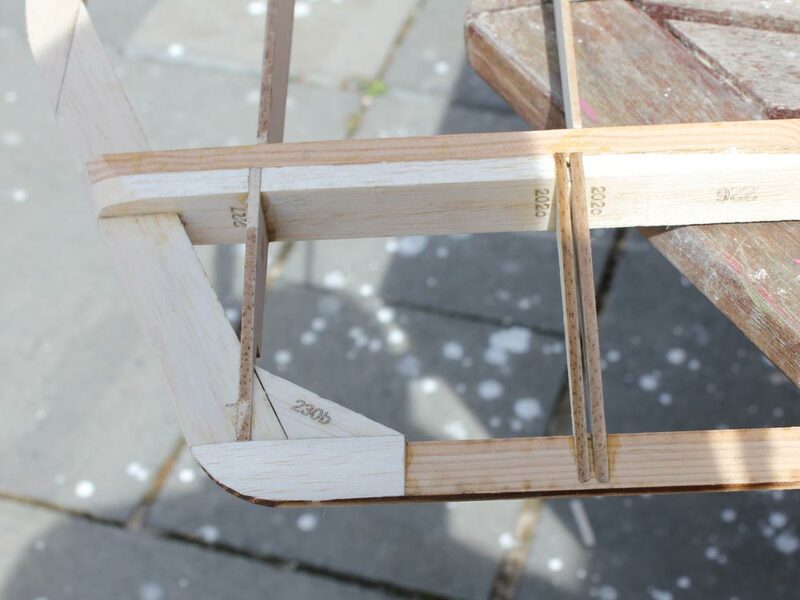 The 3/8 triangle stock between the sides and F1 was my addition. Just my paranoia I guess. 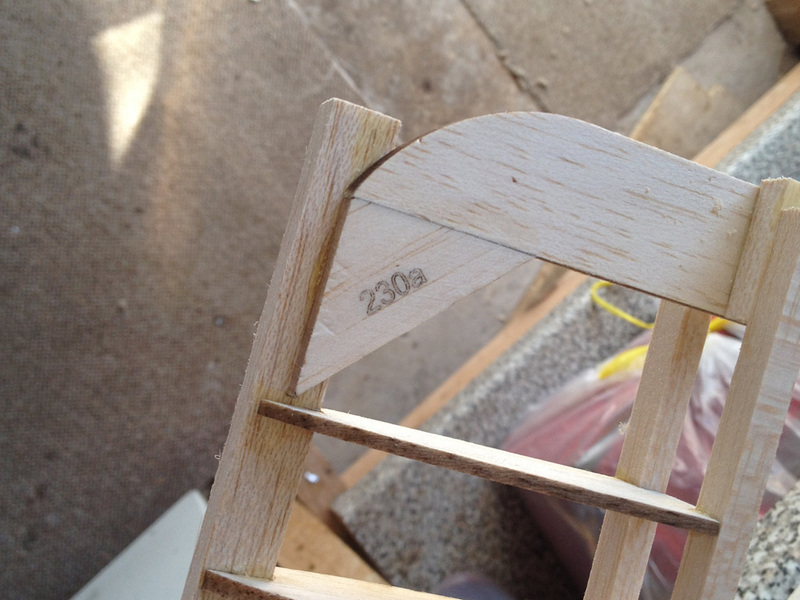 A liitle disappointed with the wood sizing, the 1/4 balsa strip is slightly narrower than the laser cut 1/4 sheet. 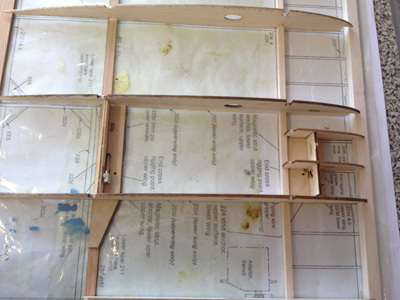 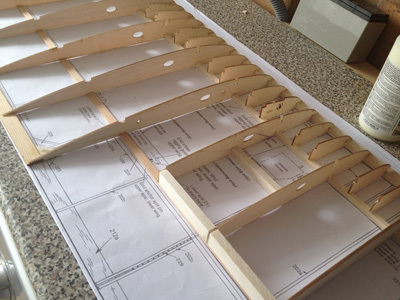 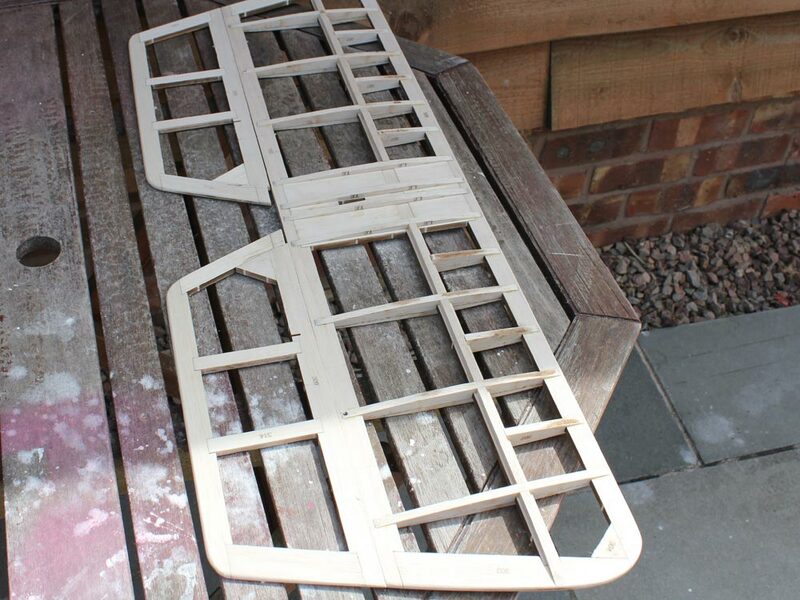 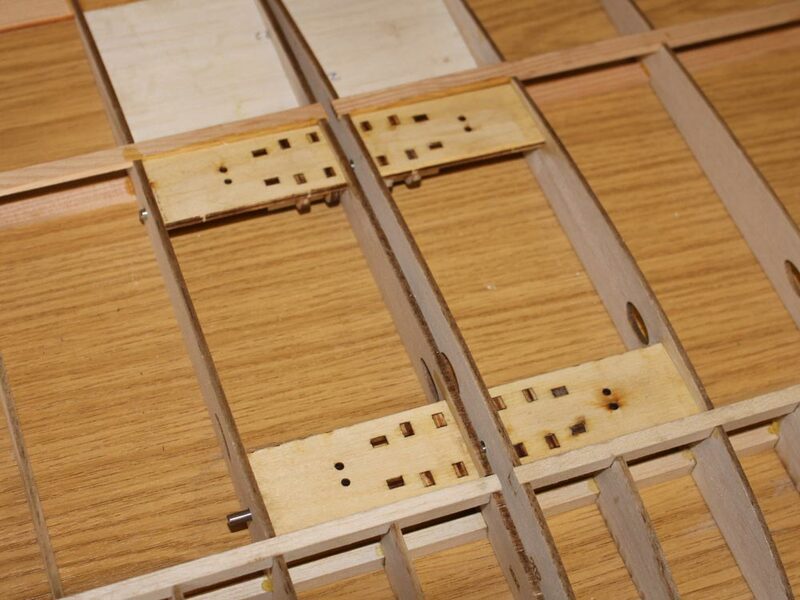 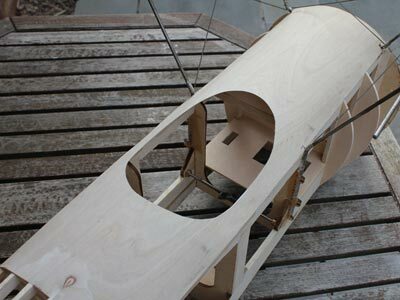 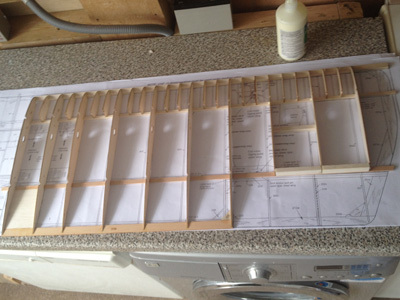 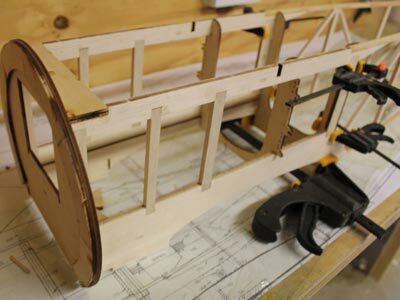 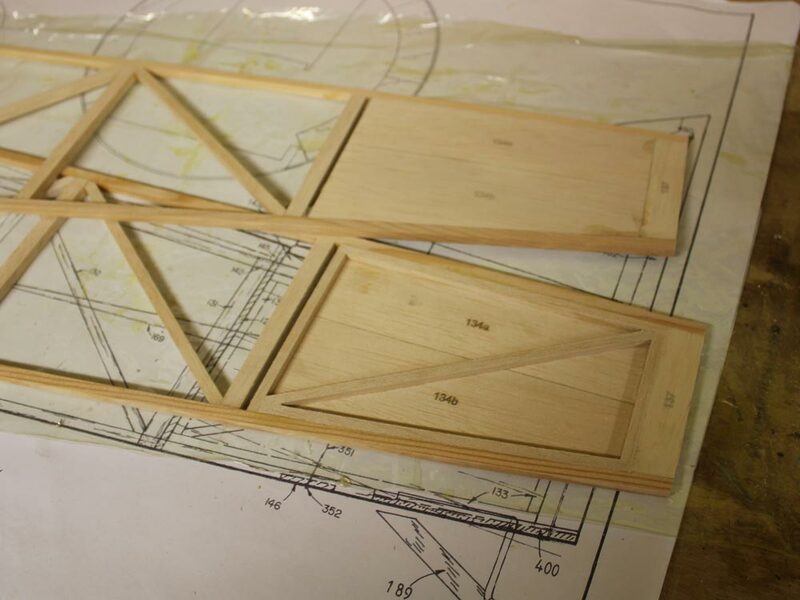 Fuselage sides built over the plan, I cut 2 pieces at a time and make sure they are the same size. 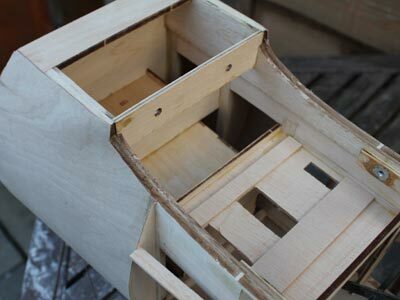 I then build the second side over the first. This ensures 2 identical sided. This cant be rushed, and plent of tea is drunk at this stage. 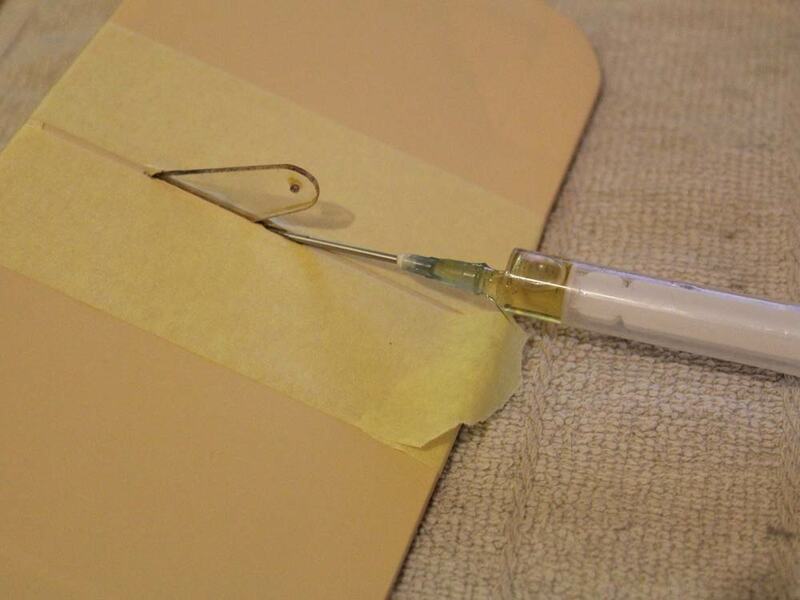 White glue is the glue of choice. 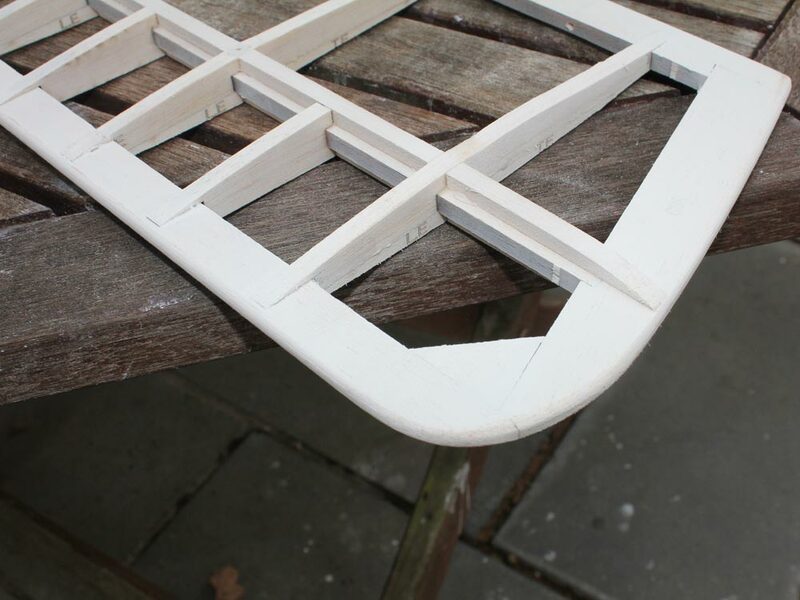 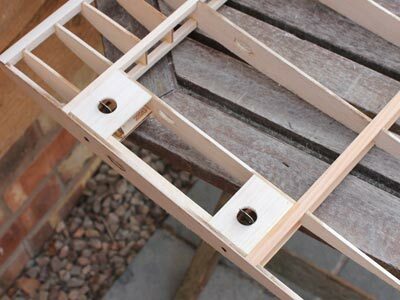 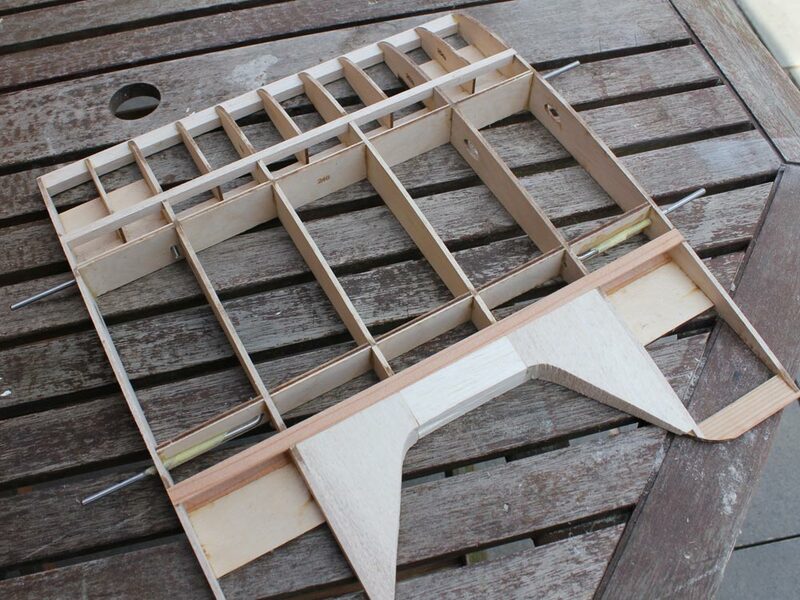 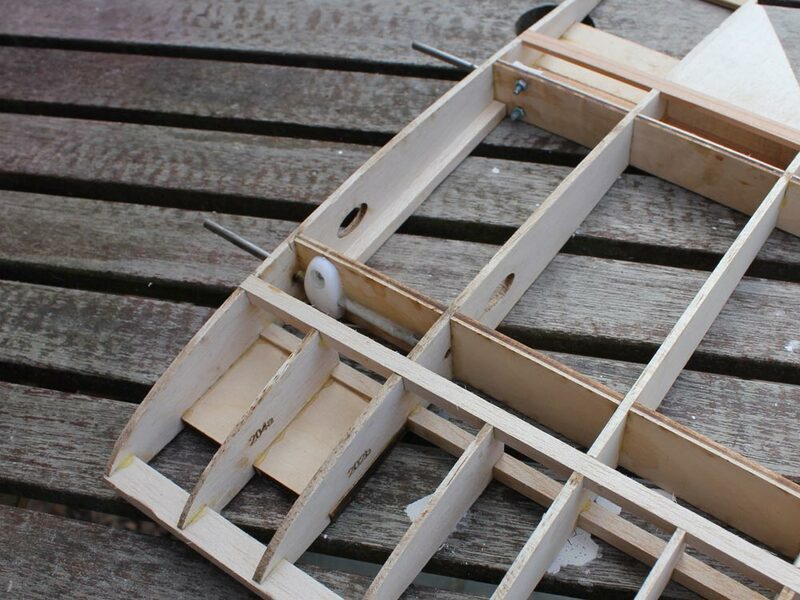 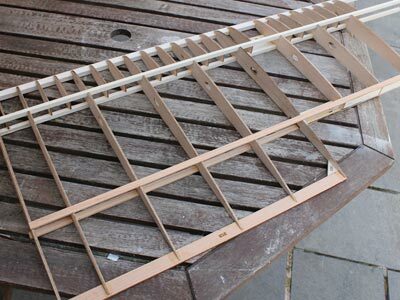 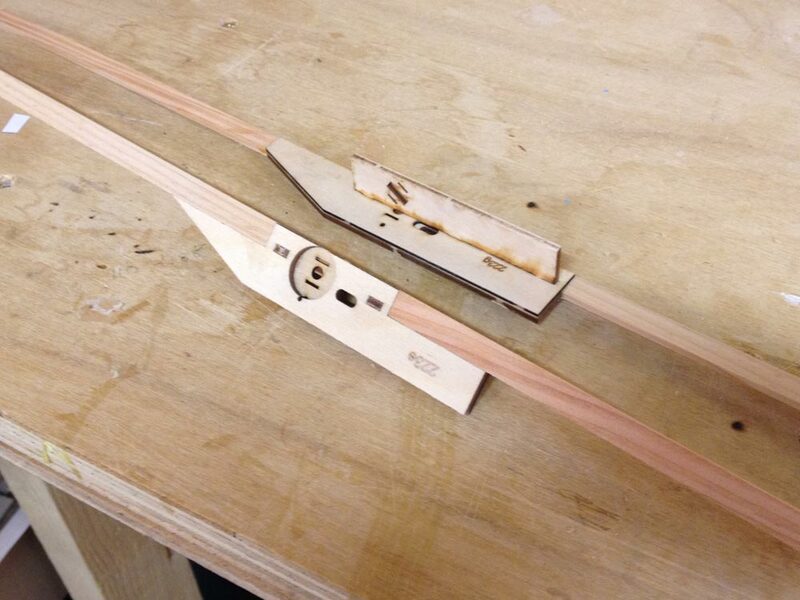 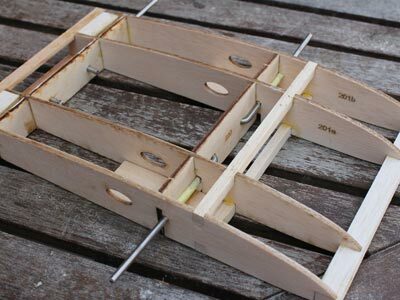 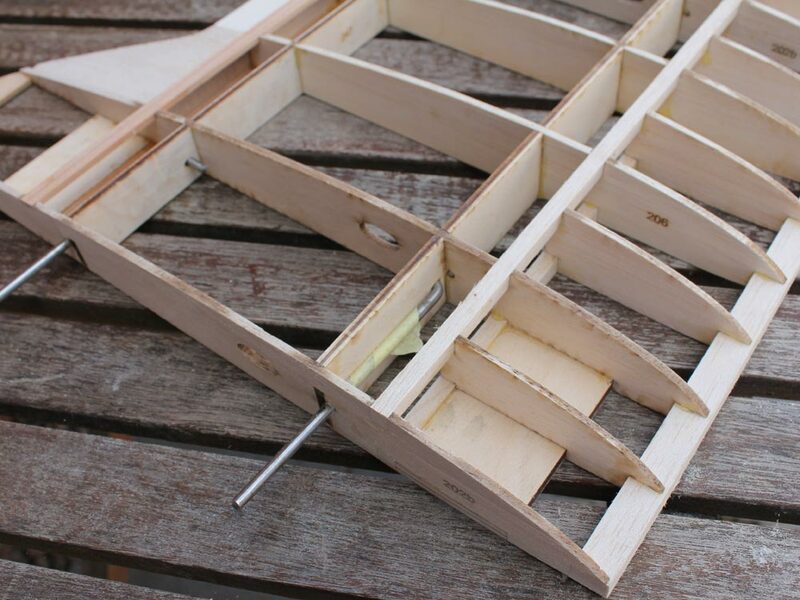 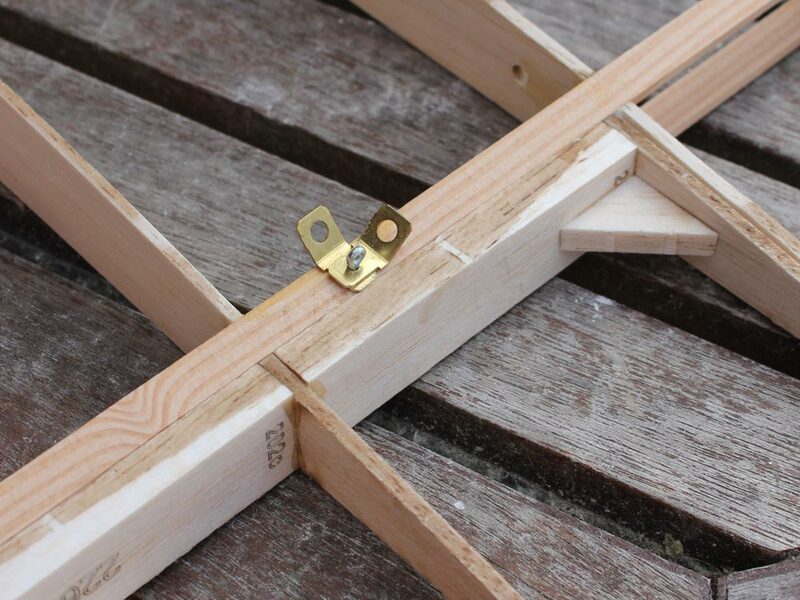 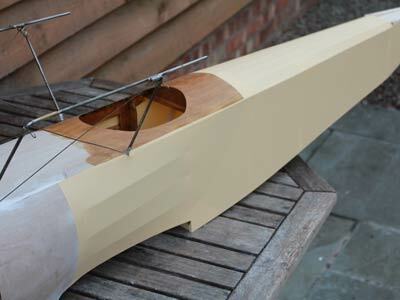 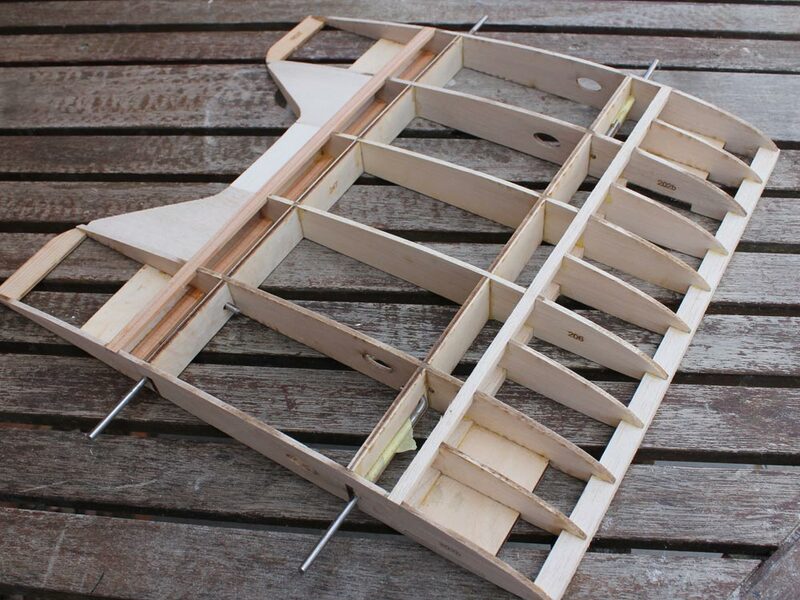 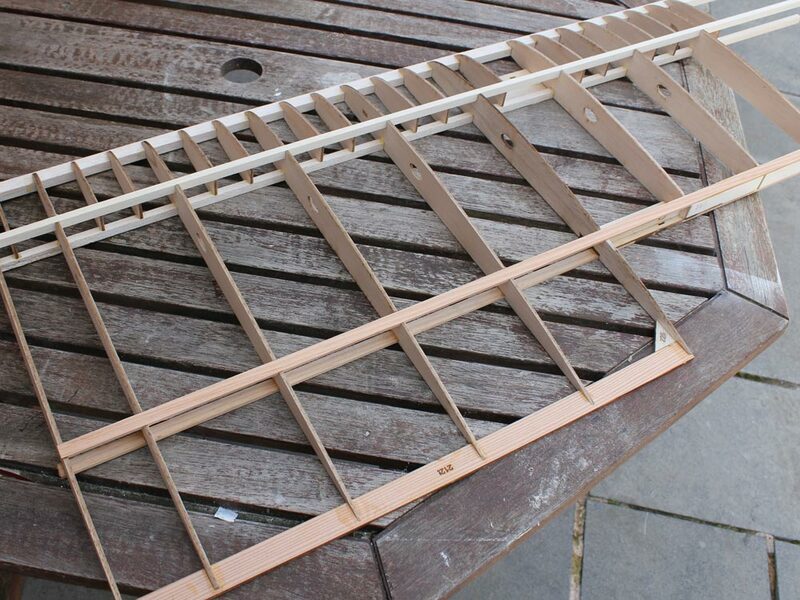 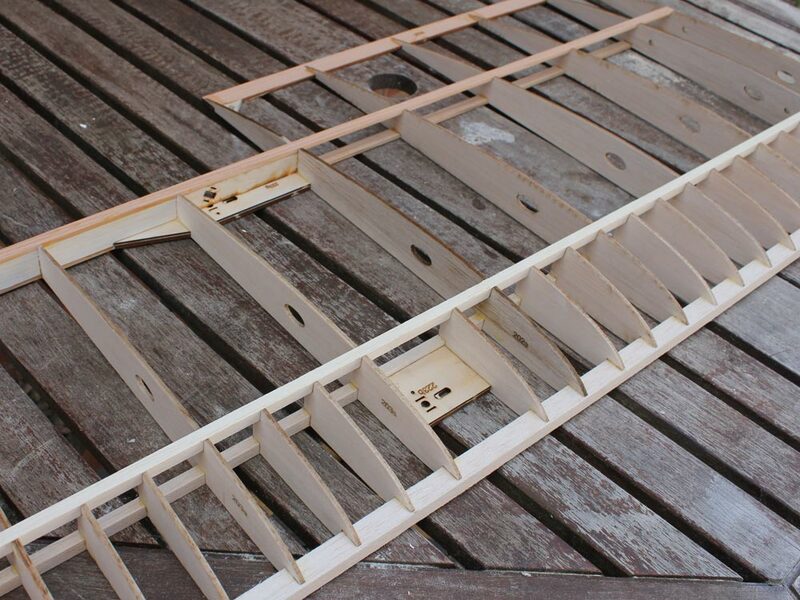 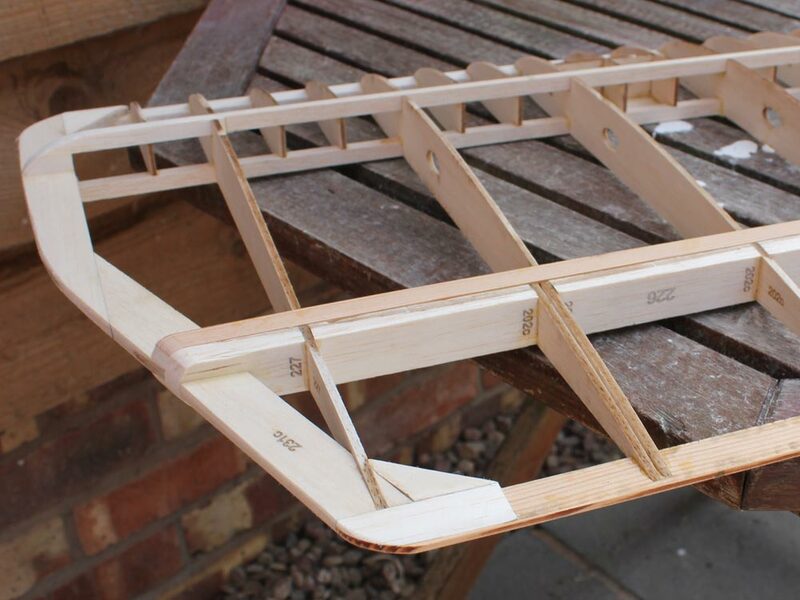 Simple start with the wing retaining bits & the wing spars.